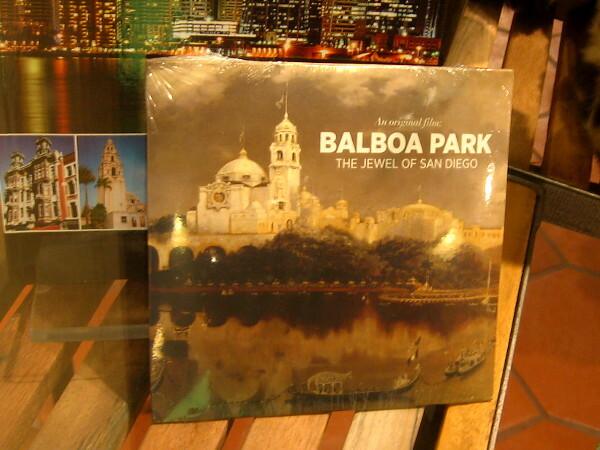 museums – Beautiful Balboa Park! 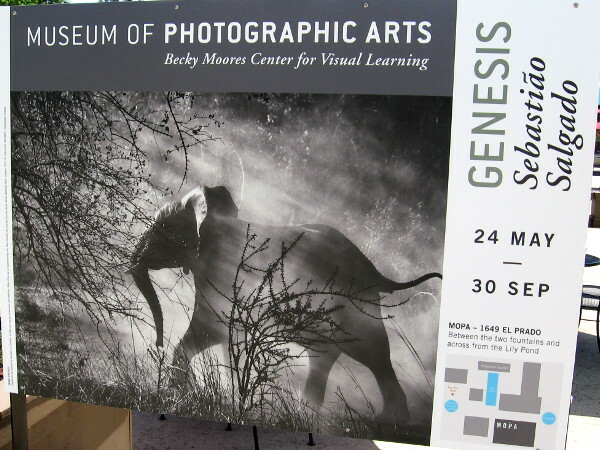 Nature photos: MOPA’s Genesis in Balboa Park. Genesis, an exhibition of Brazilian photographer Sebastião Salgado’s work, contains many stunning images. 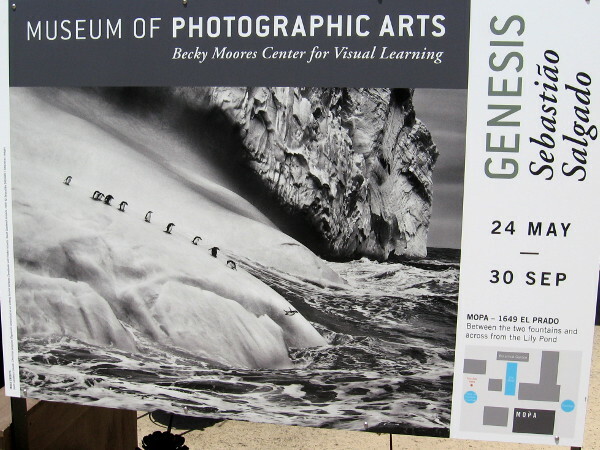 The Museum of Photographic Art’s current exhibition titled Genesis contains dozens of magnificent photographs. 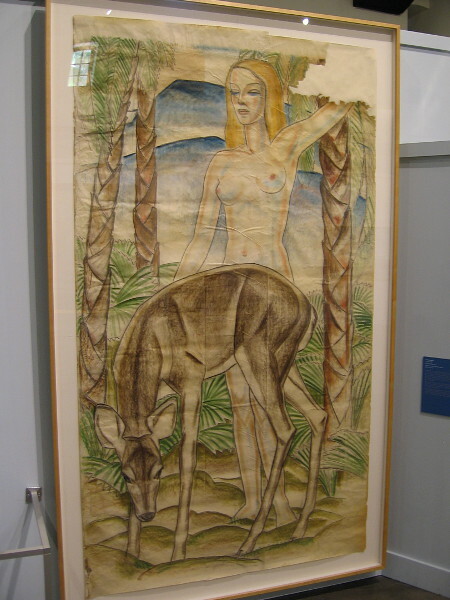 I enjoyed this exhibition in May. 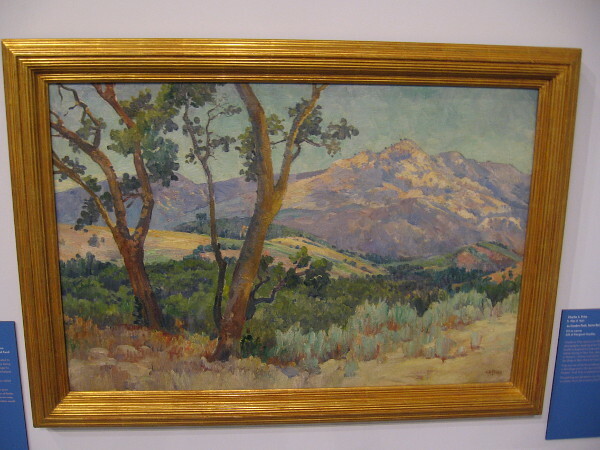 MOPA was one of several Balboa Park museums that I visited during that month’s Big Exchange promotion. 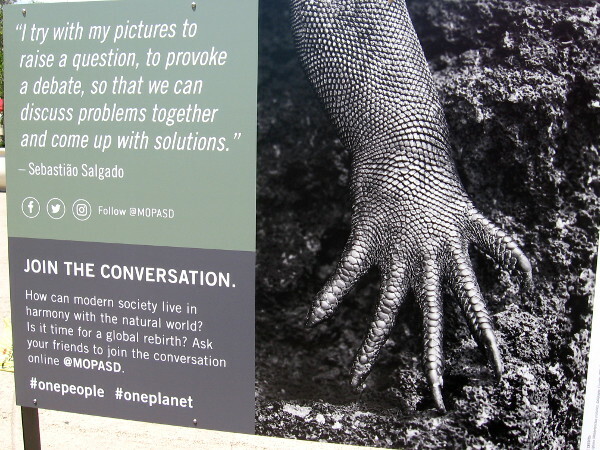 Some signs have appeared in the Plaza de Panama which show a few of these visually stunning photographs. Genesis contains the work of Brazilian photographer Sebastião Salgado, who captures the raw, wild beauty of unspoiled nature and the simplicity of people untouched by modernity. The photographs take one’s breath away. They make one yearn for a simpler, more primal, more natural existence. 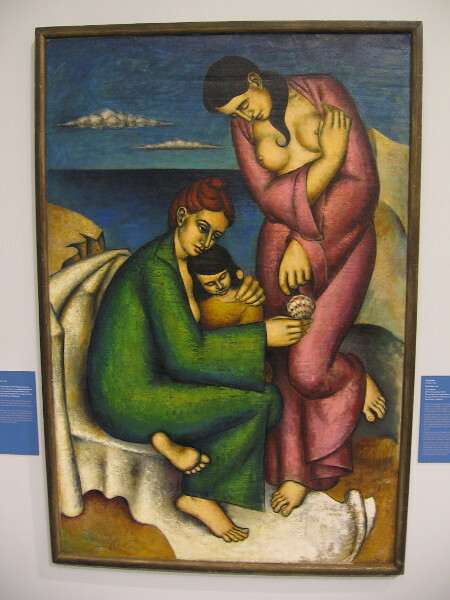 Of course, the funny thing is that the exquisite photographs themselves were created with a modern instrument, and their exhibition and transmission to thousands or millions of people relies on technology–the product of accumulated human knowledge and aspiration. 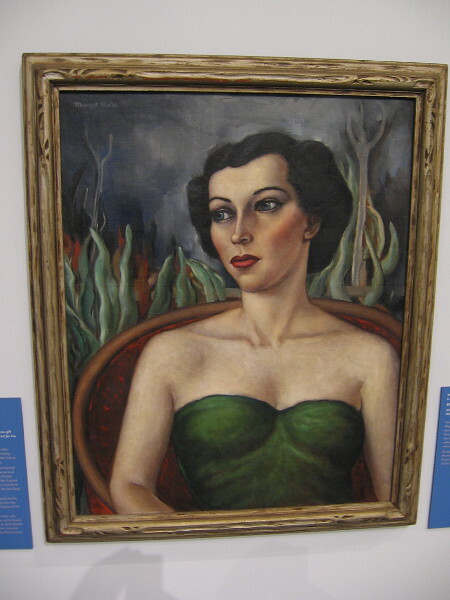 A photograph from the Museum of Photographic Arts in the Plaza de Panama. One of my favorite images by Sebastião Salgado shows penguins leaping into the ocean. 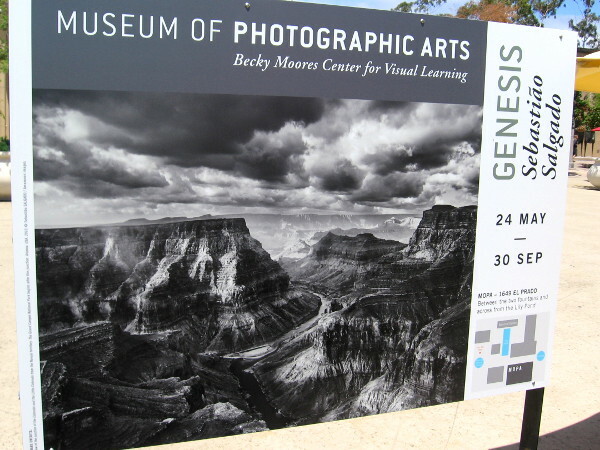 Photograph of the Grand Canyon, one of many stunning images in the Genesis exhibition at MOPA. 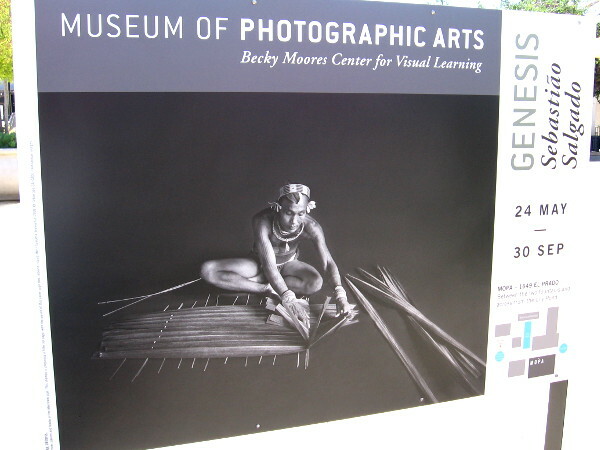 Posted on June 17, 2017 Tags art, artists, balboa park, beautiful, culture, environment, mopa, museums, nature, people, photography, plaza de panama, san diego, technologyLeave a comment on Nature photos: MOPA’s Genesis in Balboa Park. 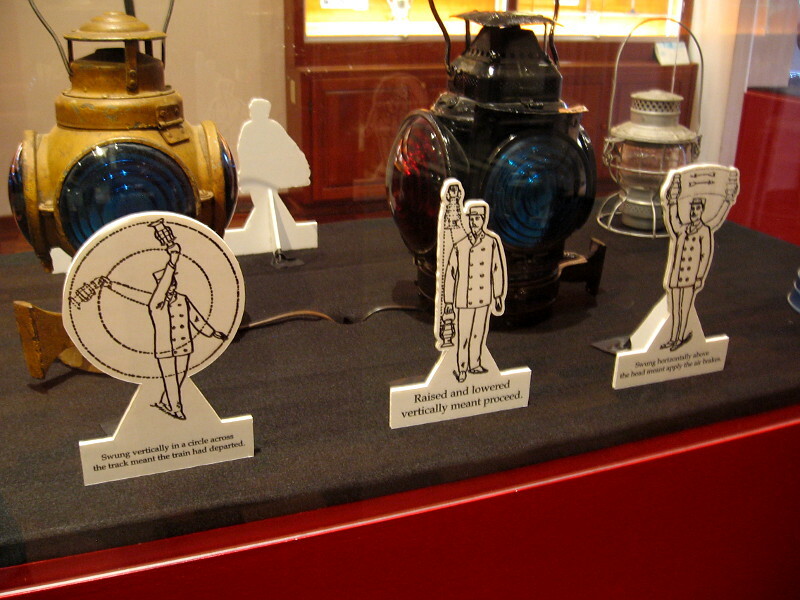 Lamp and lantern exhibit at Model Railroad Museum! Old photo and advertisement show an electric Sport-Lite lantern. 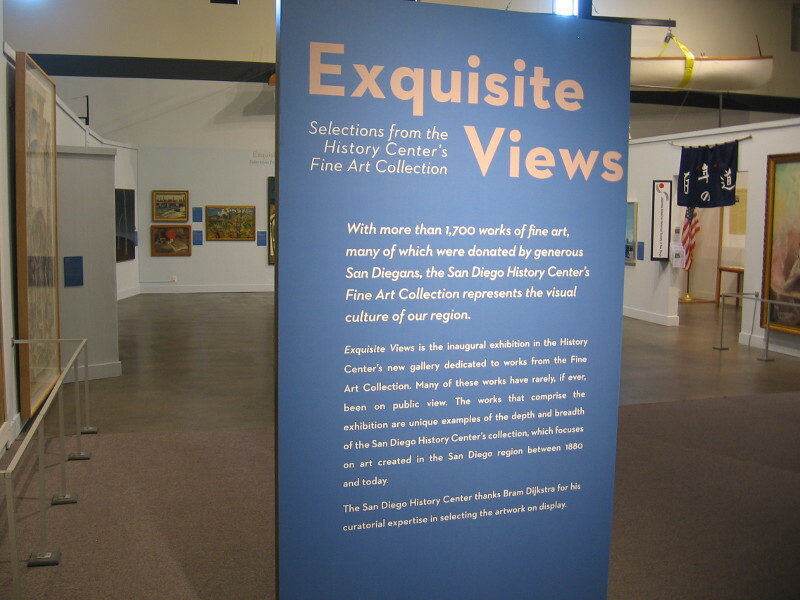 Personally, I love the San Diego Model Railroad Museum. The massive train layouts and their realistic landscapes, tiny scale buildings, streets and fun details make me feel like a kid again. 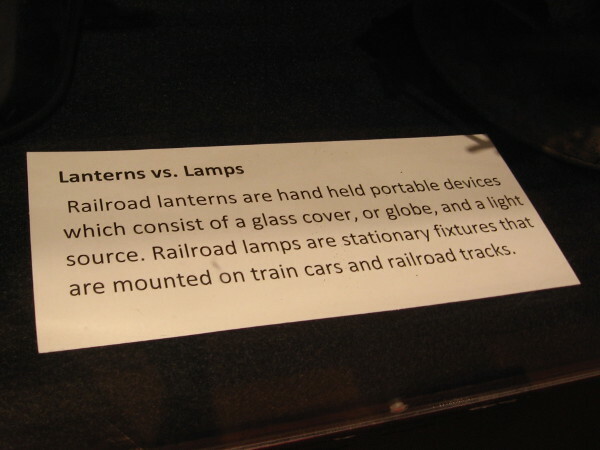 During a recent visit, I was excited to see the museum had a fine exhibit concerning the history of railroad lamps and lanterns. 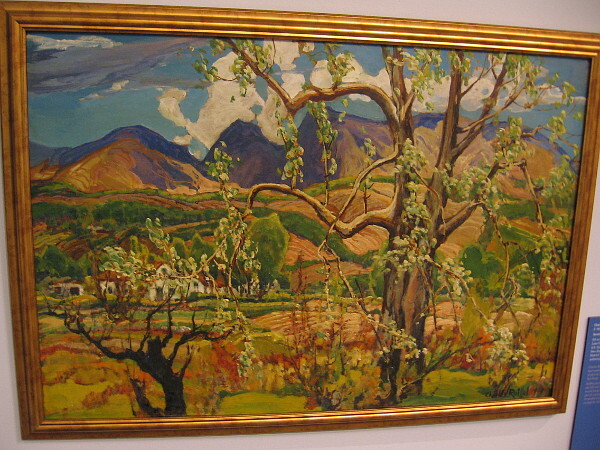 I took a few photos for you to enjoy and I added descriptive captions, but I suggest a visit in person. There’s so much to absorb, so much history and sheer fun! You can see photos of the museum’s gigantic model train layouts here! 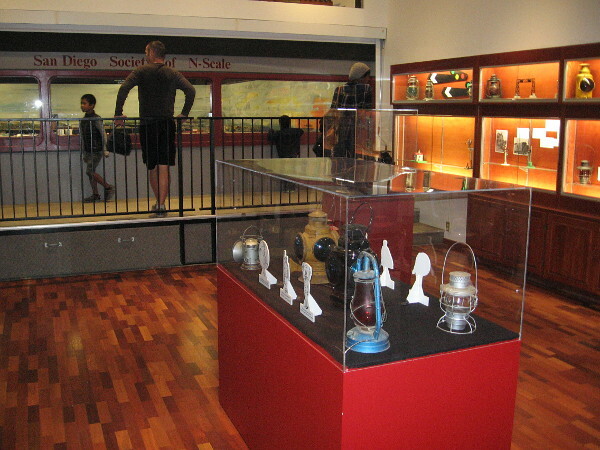 Exhibit inside the San Diego Model Railroad Museum, located near the N-Scale layout, shows old railroad lamps and lanterns and recalls their history. 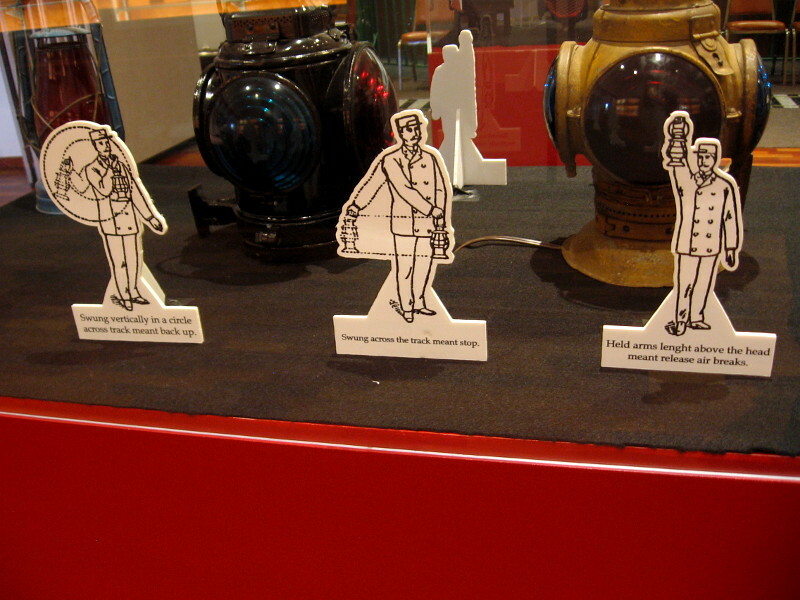 Railroad lanterns were held by hand, and manual signals were used for night communication. 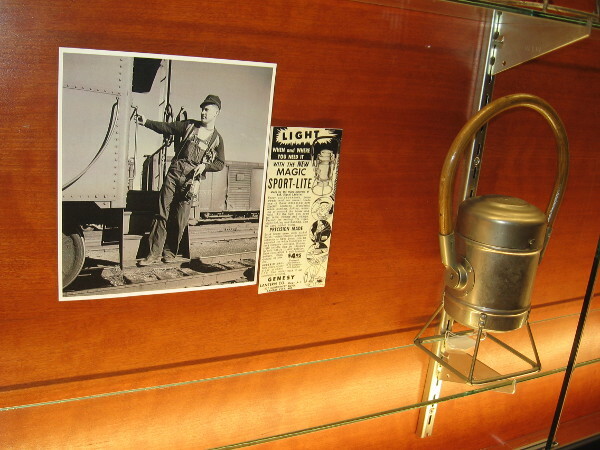 Railroad lamps were mounted on train cars and railroad tracks. 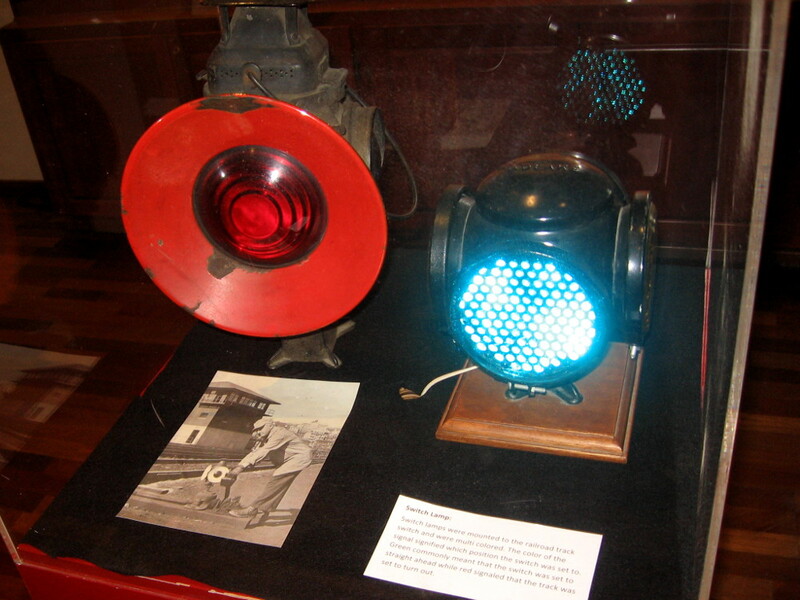 Two examples of switch lamps. They were mounted to a railroad track switch and indicated the current position of the switch. Old diagram of an Adlake No. 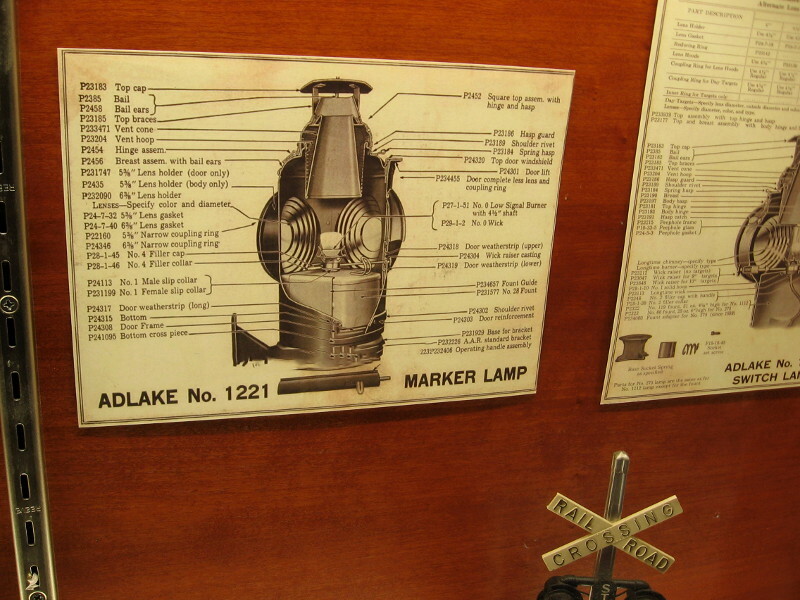 1221 marker lamp. 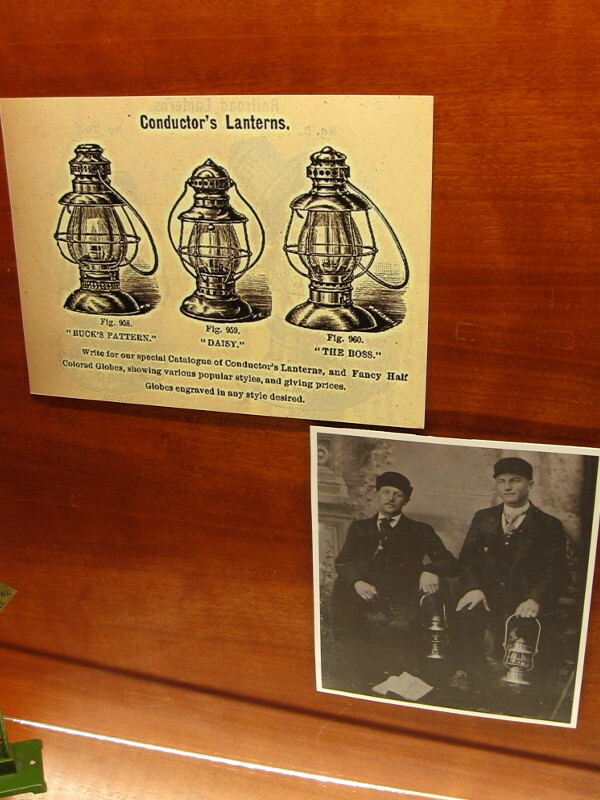 Three models of conductor’s lanterns: Buck’s Pattern, Daisy, and The Boss. Three lantern hand signals: the train has departed, proceed, and apply the air brakes. Three additional lantern hand signals: back up, stop, and release the air brakes. 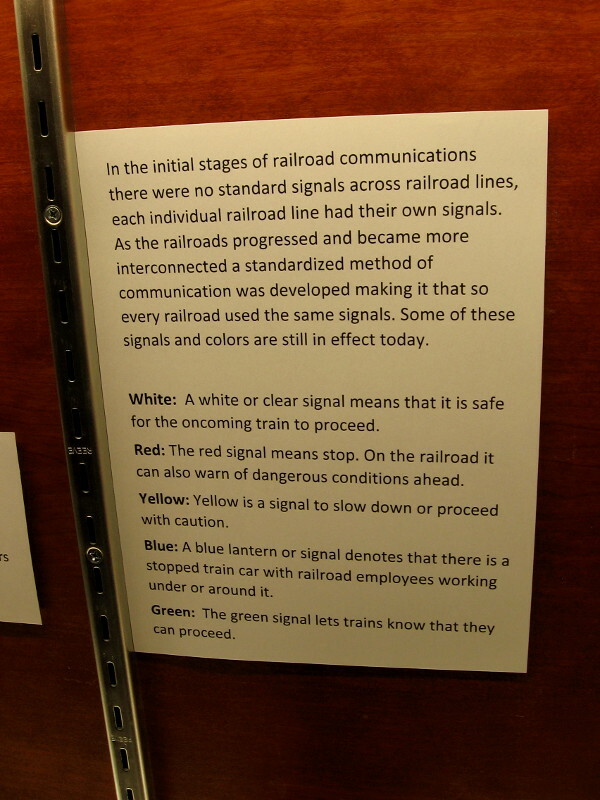 Over the years signals and colors used for railroad communication became standardized. This sign describes what different colored lights indicate. 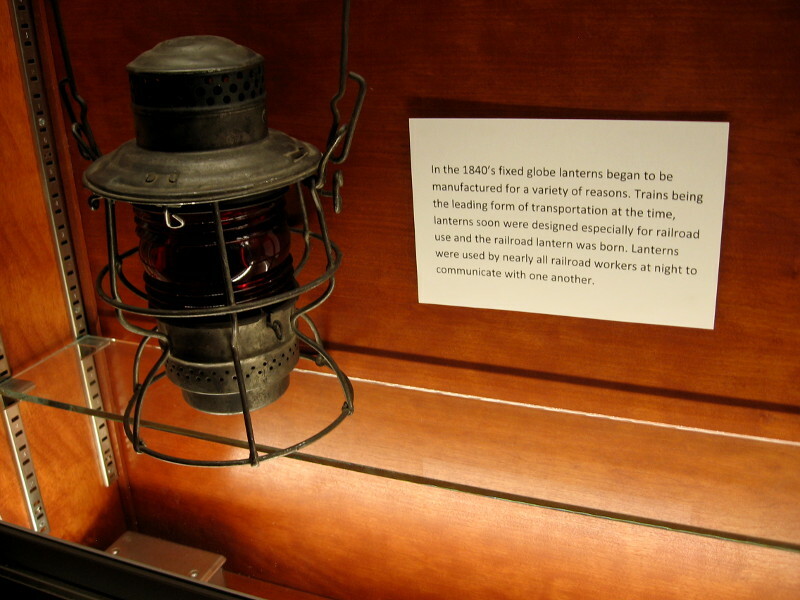 Fixed globe railroad lanterns began to be used in the 1840s. At night they allowed railroad workers to communicate. 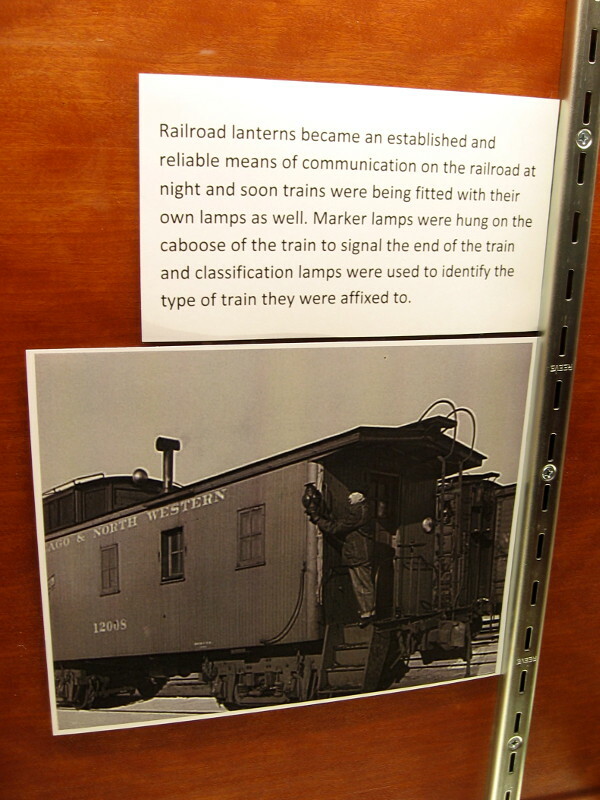 Marker lamps were hung on the train’s caboose to identify the train and show where it ended. 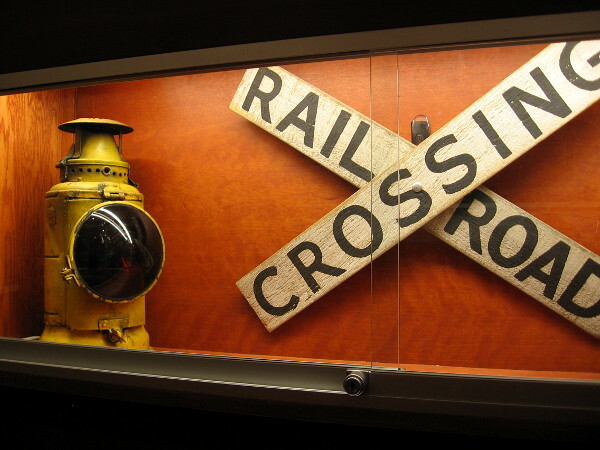 A fascinating exhibit concerning the history of railroad lamps and lanterns is now on display in Balboa Park’s amazing San Diego Model Railroad Museum! 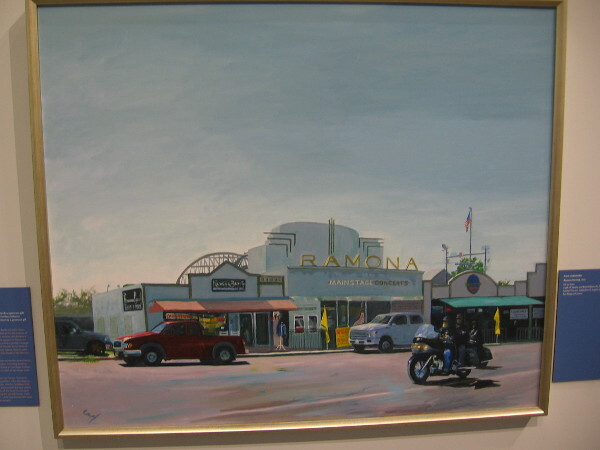 Posted on May 10, 2017 Tags americana, balboa park, fun, history, model railroad museum, museums, nostalgia, railroads, tourism, trains, transportation, travelLeave a comment on Lamp and lantern exhibit at Model Railroad Museum! 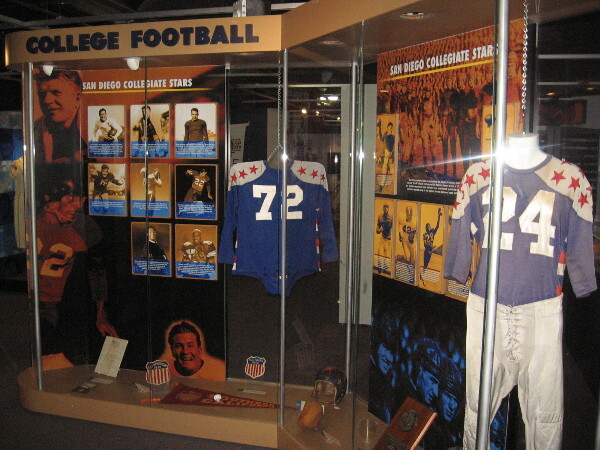 A final look inside the San Diego Hall of Champions. 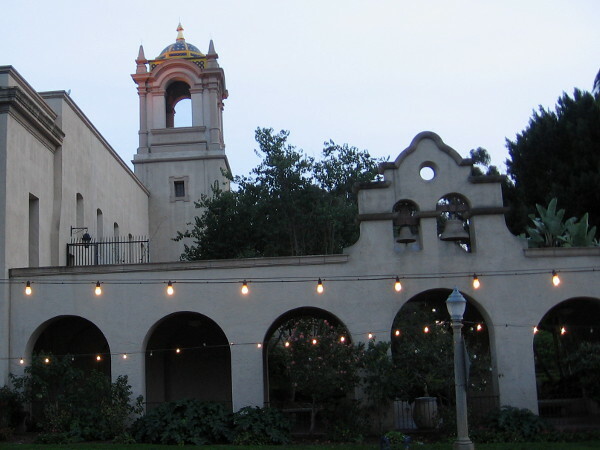 The San Diego Hall of Champions now occupies the historic Federal Building in Balboa Park. 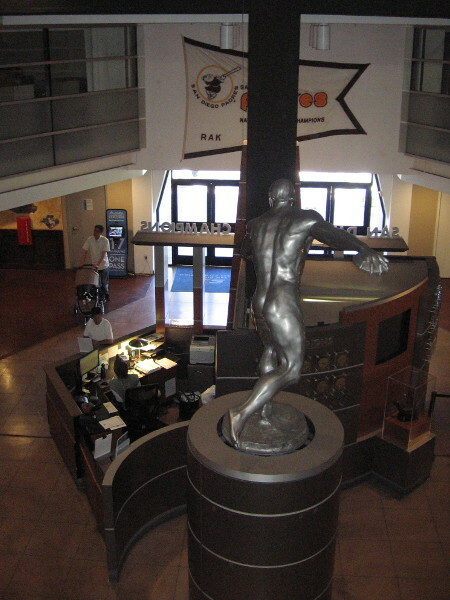 The sports museum will soon close. 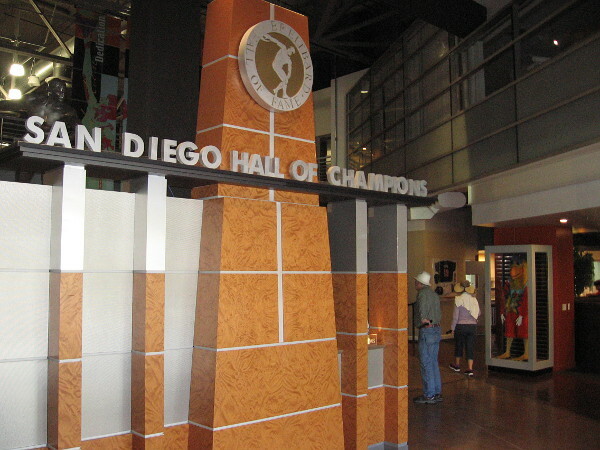 San Diego’s Hall of Champions will soon close. 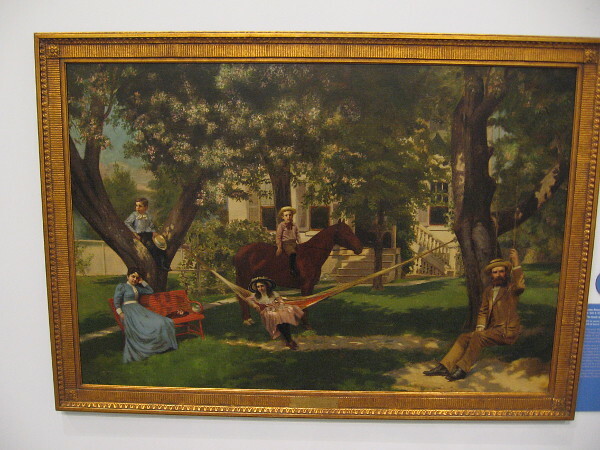 I was told yesterday that the museum’s final day is uncertain, but most likely imminent. 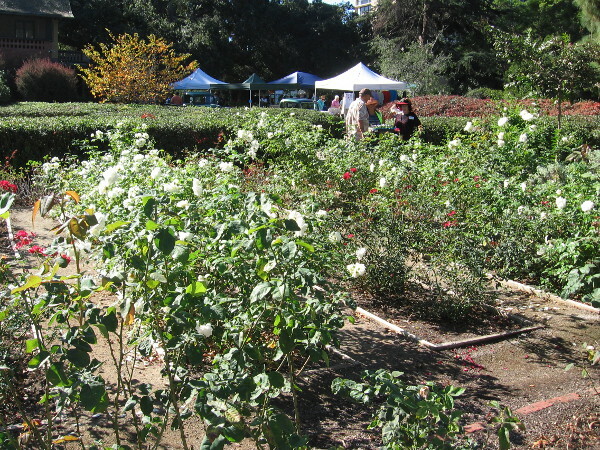 So you’d better hurry on over to Balboa Park before it is gone forever. A couple days ago news broke that the historic Federal Building in Balboa Park’s Palisades area, which has been the location of the Hall of Champions for many years, will become the home of a brand new San Diego Comic-Con museum. It’s an exciting bit of news and should revitalize this slightly less active section of Balboa Park. I’m sure the neighboring museums will benefit from what is sure to be a very popular attraction. But it’s so very, very sad to see the Hall of Champions come to an end. 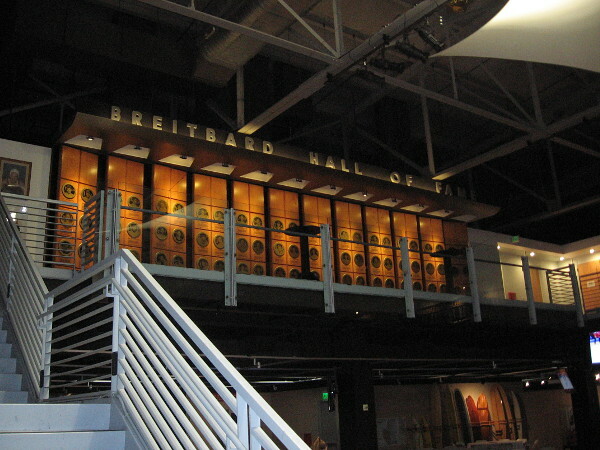 I learned the plaques from the Breitbard Hall of Fame will be relocated to the Western Metal Supply Co. at Petco Park, and the Padres will claim the exhibits that pertain to their team. The San Diego Chargers exhibits will head up to Los Angeles now that the team has moved north. 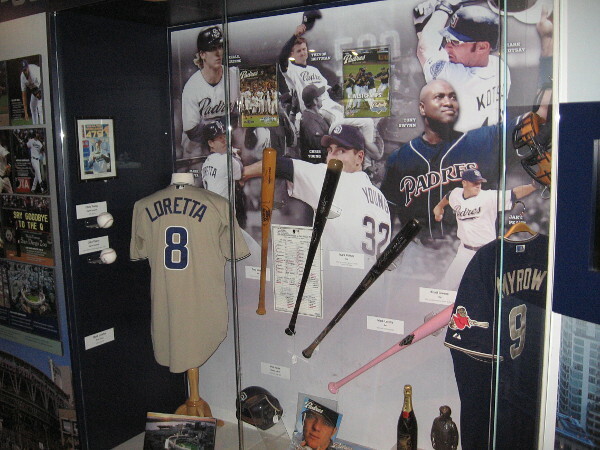 Other sports artifacts and bits of memorabilia will be claimed by their respective owners: athletes, teams, collectors and sports organizations. So, I suppose, the history of athletic achievement in San Diego will live on. 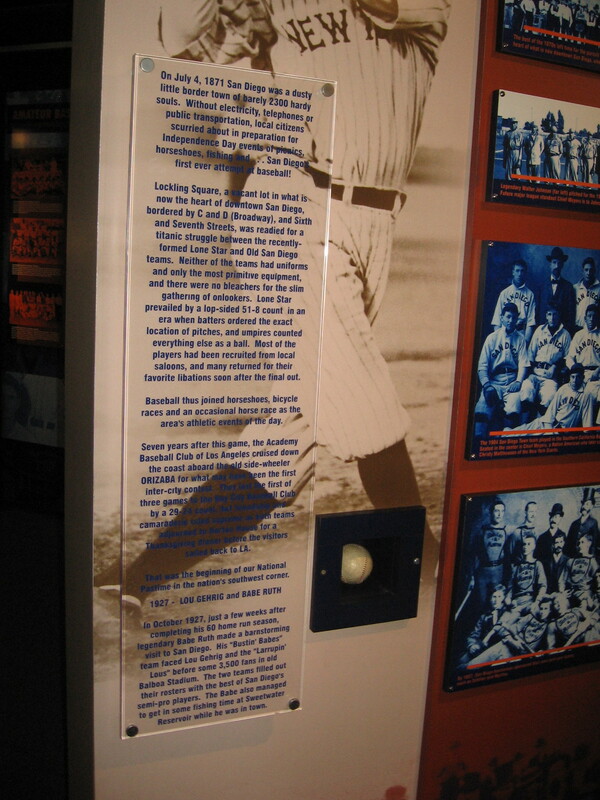 Here’s one final look inside the Hall of Champions. It’s where many fantastic memories were made and preserved. 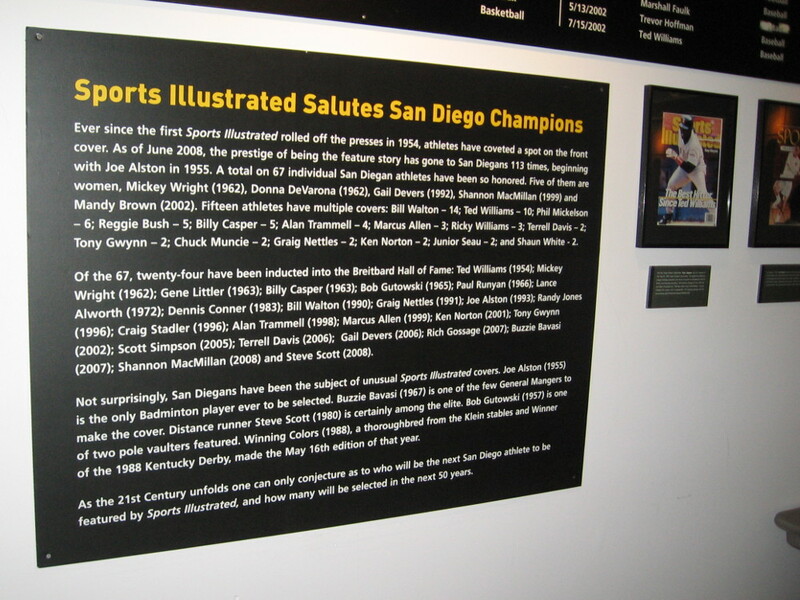 San Diego has been home to some of the world’s greatest champions, including baseball’s Tony Gwynn, skateboarding’s Tony Hawk, NASCAR’s Jimmie Johnson, golf’s Phil Mickelson, basketball’s Bill Walton, boxing’s Ken Norton, diving’s Greg Louganis, sailing’s Dennis Conner . . . and many others. Peering into the entrance of the Hall of Champions. 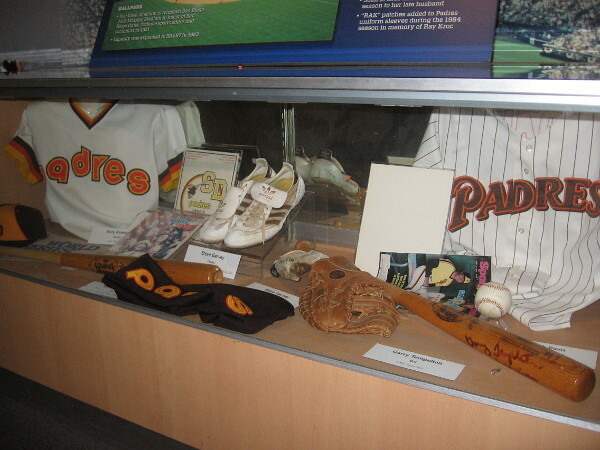 Colorful exhibits celebrate San Diego champions from a wide variety of sports. 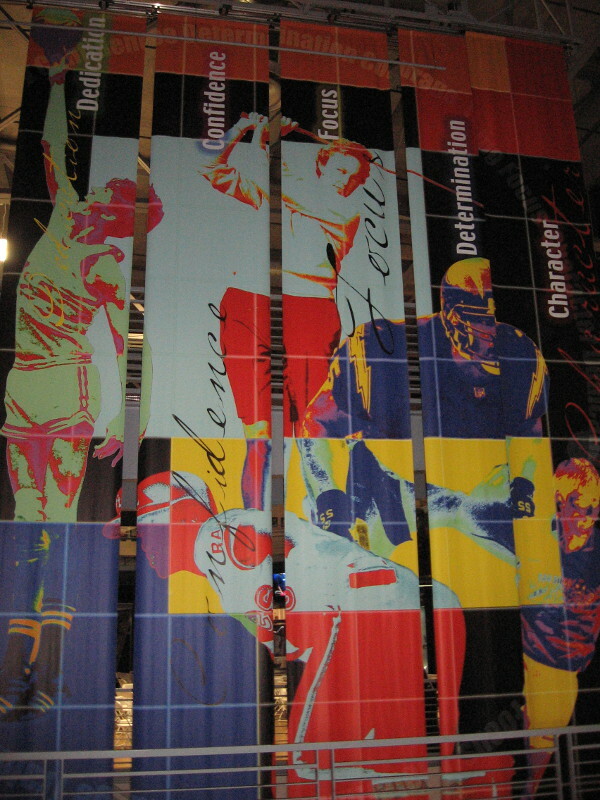 Large banners inside the museum entrance honor an athlete’s dedication, confidence, focus, determination and character. 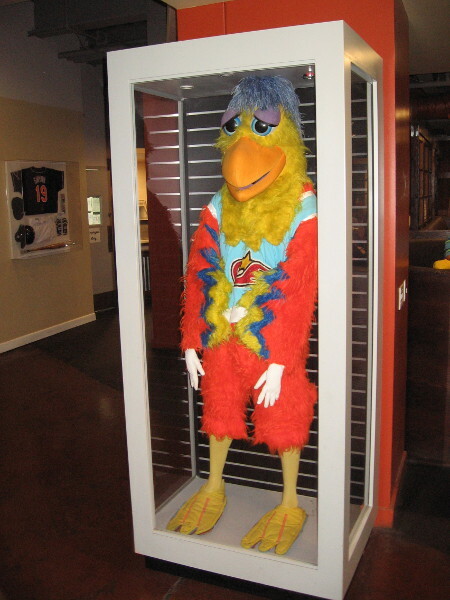 A San Diego Chicken suit worn by Ted Giannoulas. The funny mascot is known and loved worldwide. 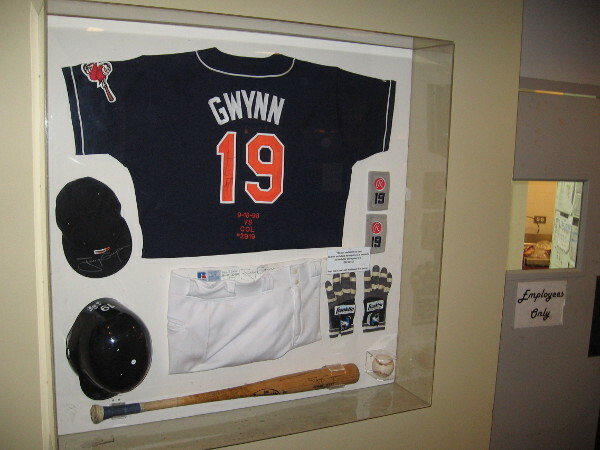 Tony Gwynn jersey and memorabilia near the Hall of Champion’s indoor cafe. 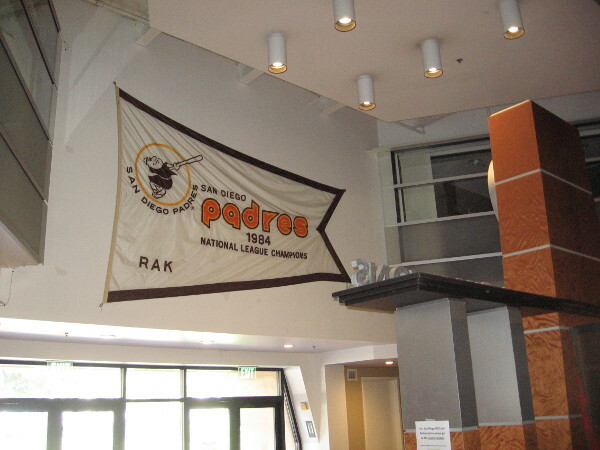 A big National League Champions pennant above the front door of the Hall of Champions, won by the San Diego Padres in 1984. 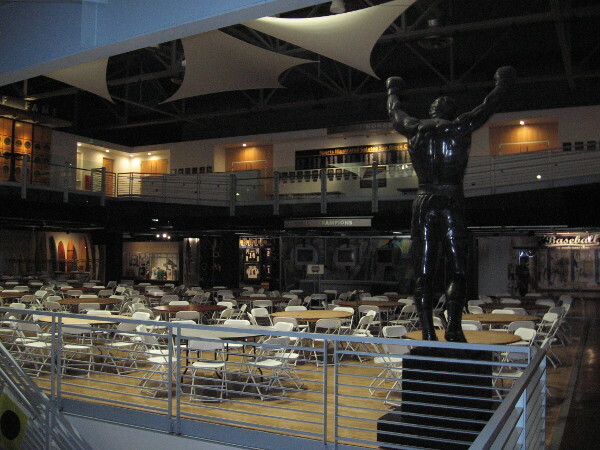 A large statue of Muhammad Ali stands above an event space where many local sports award ceremonies are held. 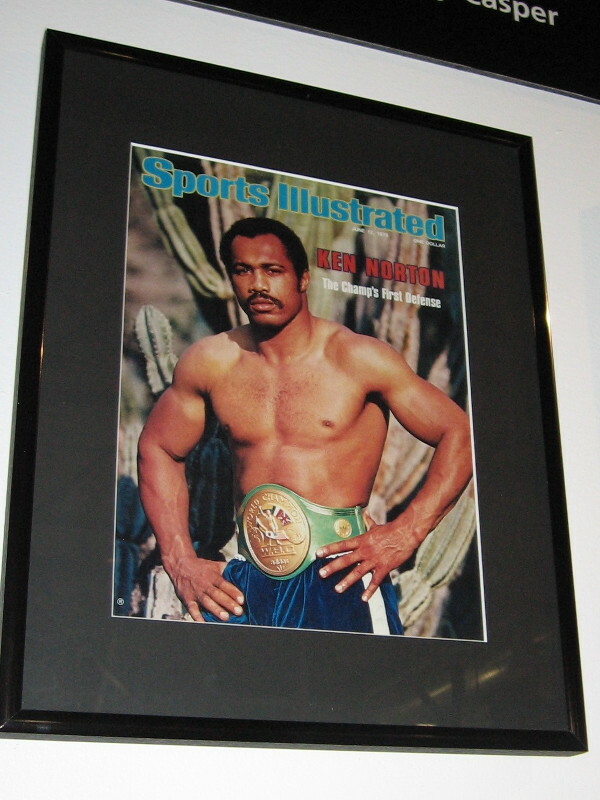 Ali was defeated by Ken Norton at the San Diego Sports Arena in 1973. 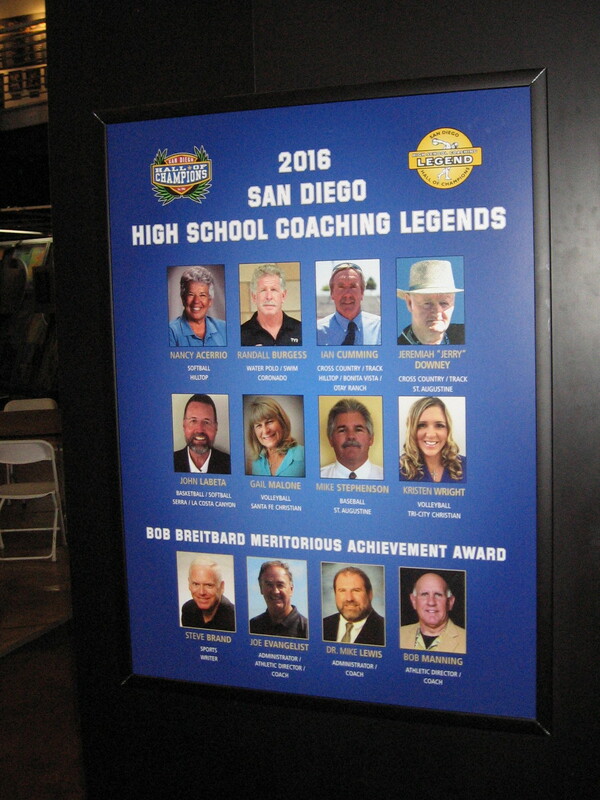 The Hall of Champions honors local high school coaching legends. 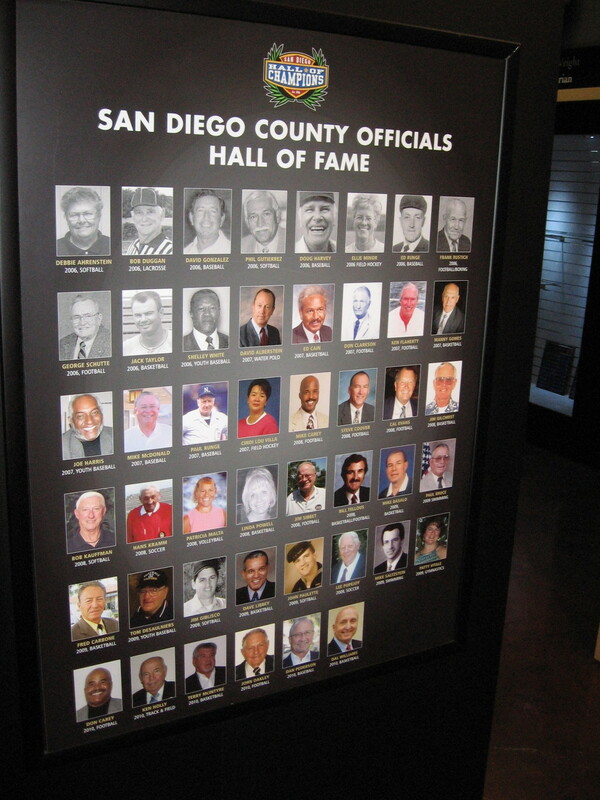 The San Diego County Officials Hall of Fame. 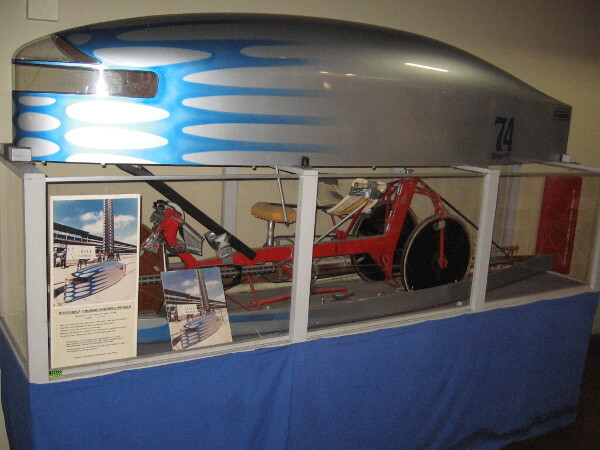 The Dragonfly II human powered vehicle is on display in the museum. 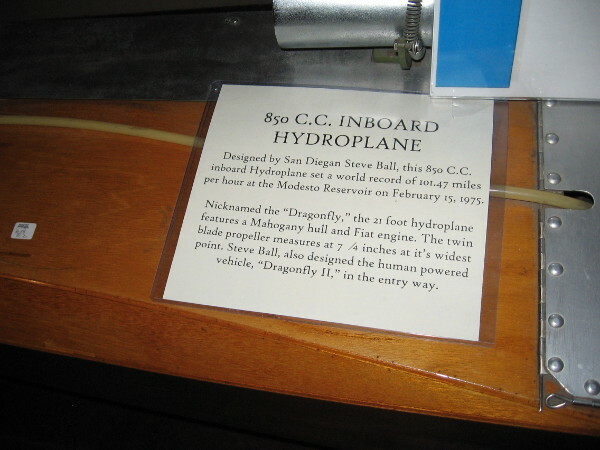 Sign describes the Dragonfly II. 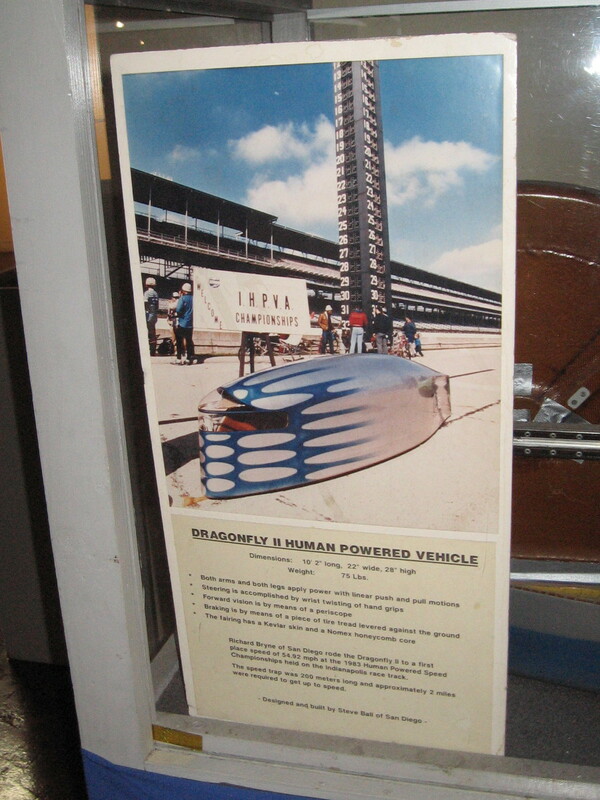 Richard Byrne of San Diego rode it to a first place finish at the 1983 Human Powered Speed Championships held on the Indianapolis race track. 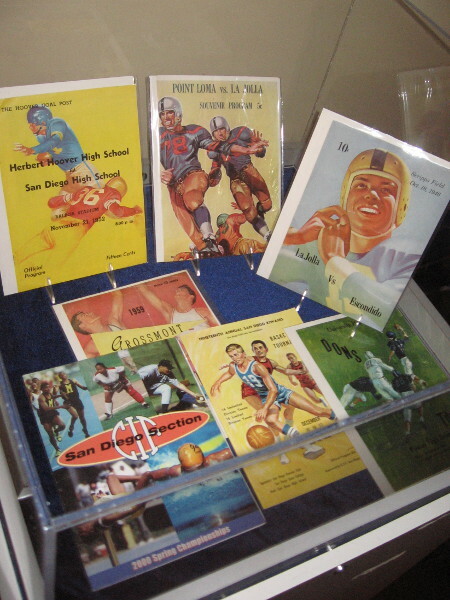 One display case contains old high school sports souvenir programs. 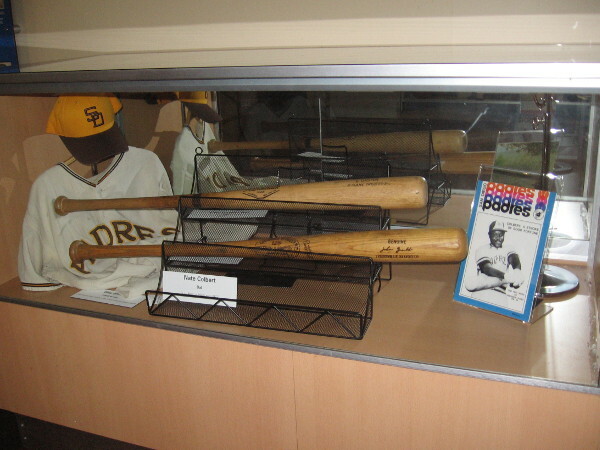 Another case holds objects related to Padres home run slugger Nate Colbert. 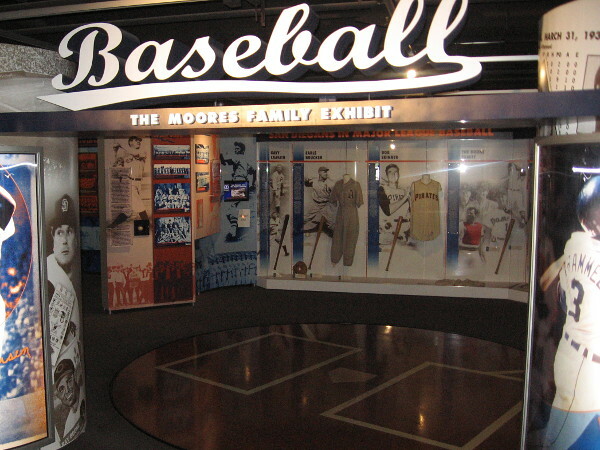 The San Diego Hall of Champions has an extensive Moores Family Baseball Exhibit. 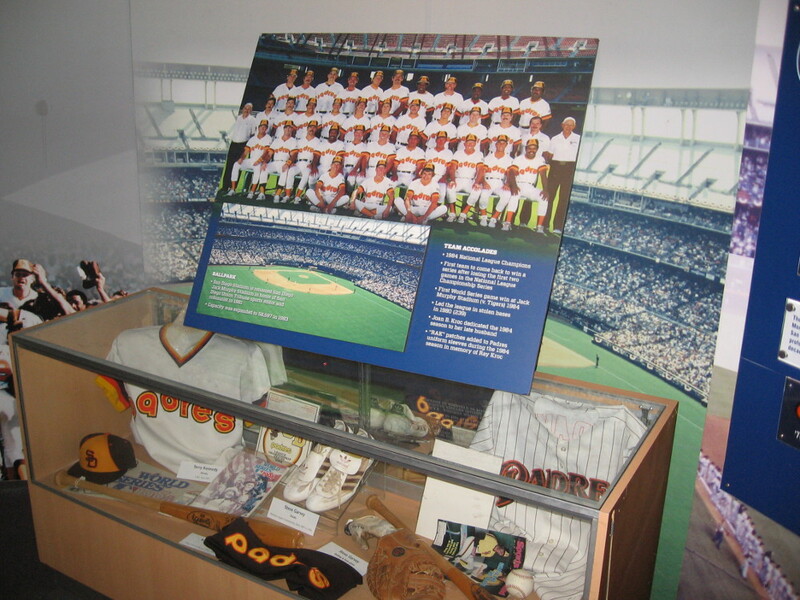 The exhibit features many memorable moments in San Diego Padres baseball history. 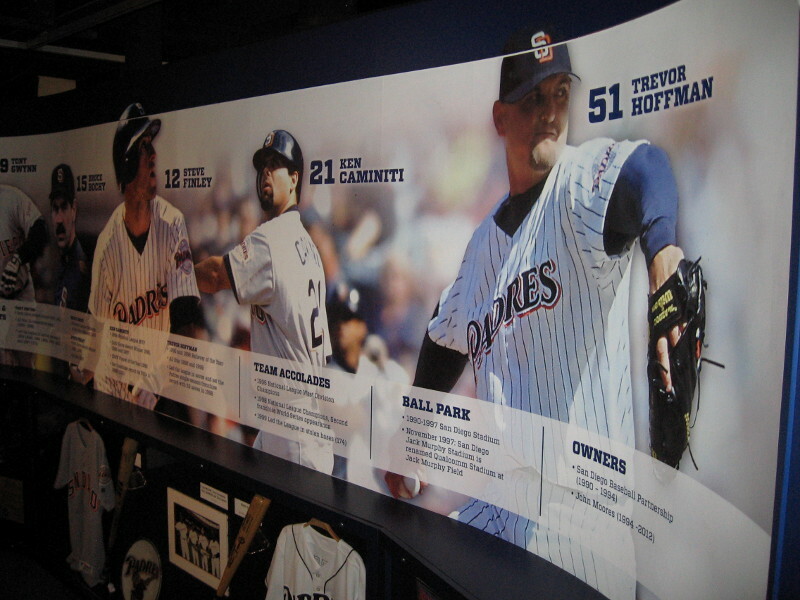 Top players in Padres history include Trevor Hoffman, Ken Caminiti and Steve Finley. Bruce Bochy is remembered as a fan favorite manager. Remembering the 1984 National League Champion Padres. Major League Baseball’s Padres are a beloved sports team in San Diego. 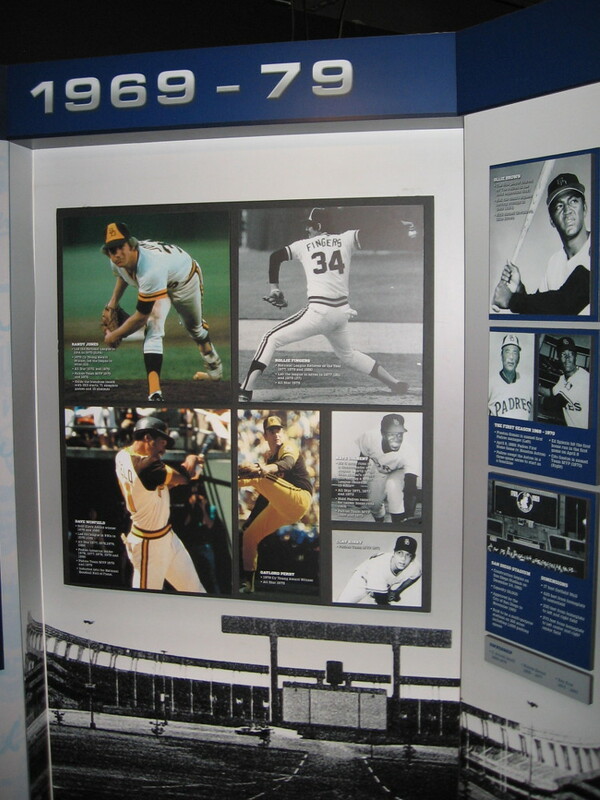 Notable Padres players in the 1970’s include Randy Jones, Rollie Fingers, Dave Winfield and Gaylord Perry. 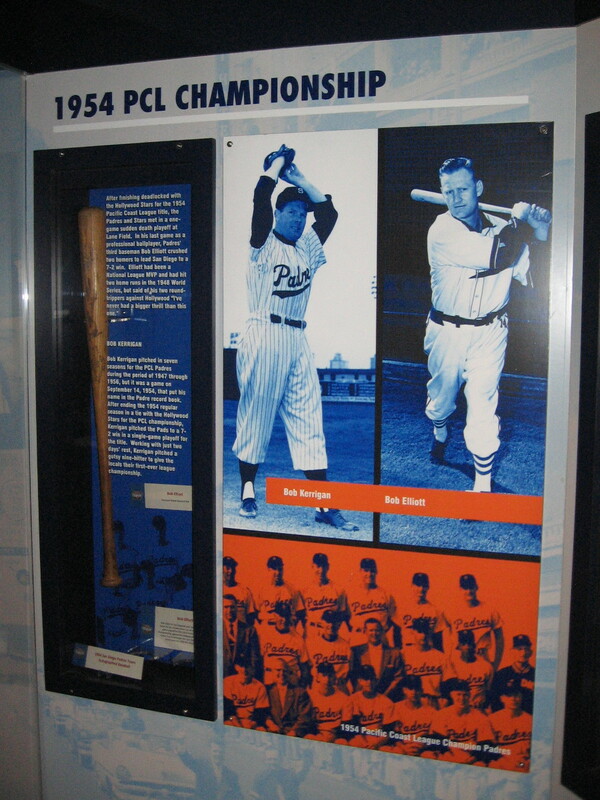 Display recalls the 1954 PCL Championship, won by the Padres. 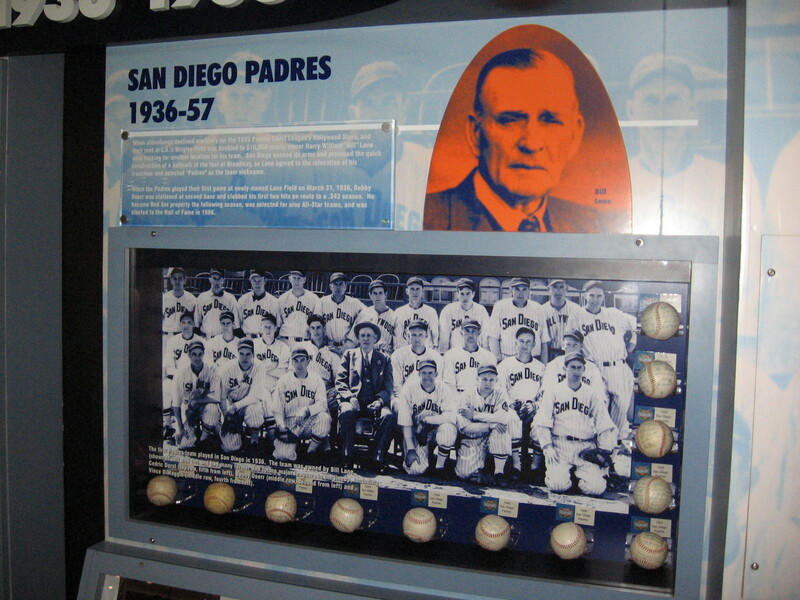 Another display shows the San Diego Padres in their earliest years. On July 4, 1871 San Diego was a dusty little border town of barely 2300 hardy souls. On this day baseball was first played in our city! 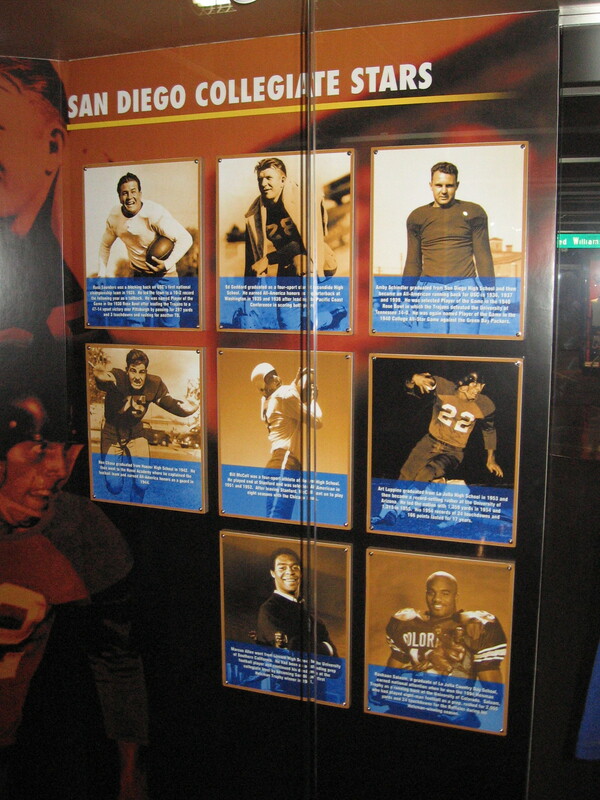 One section in the Hall of Champions honors San Diego Collegiate Stars of football. 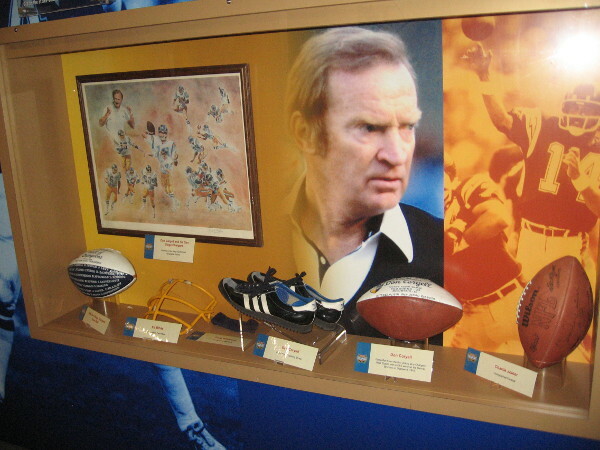 Local college football memories live on at the Hall of Champions. 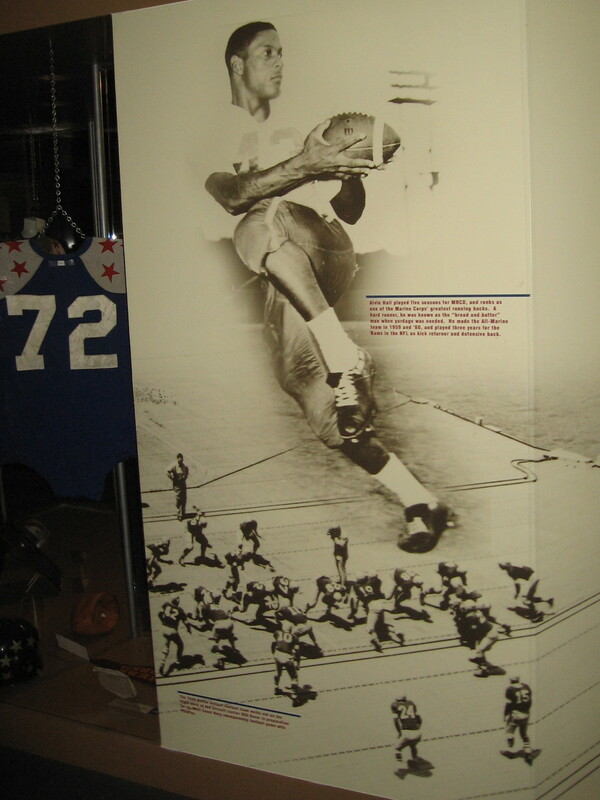 Alvin Hall played five seasons for MCRD, and ranks as one of the Marine Corps’ greatest running backs. 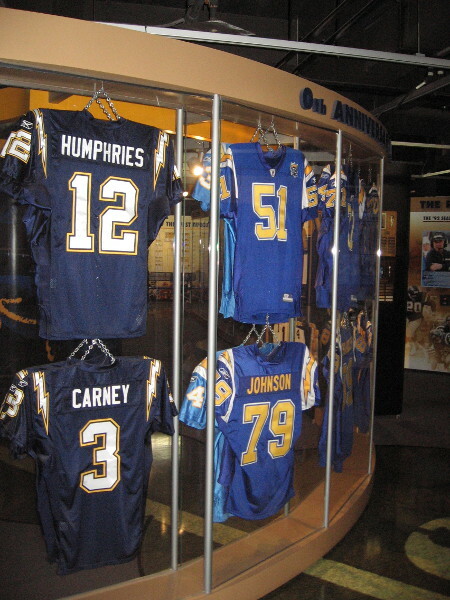 The San Diego Chargers exhibit at the Hall of Champions includes many player jerseys. 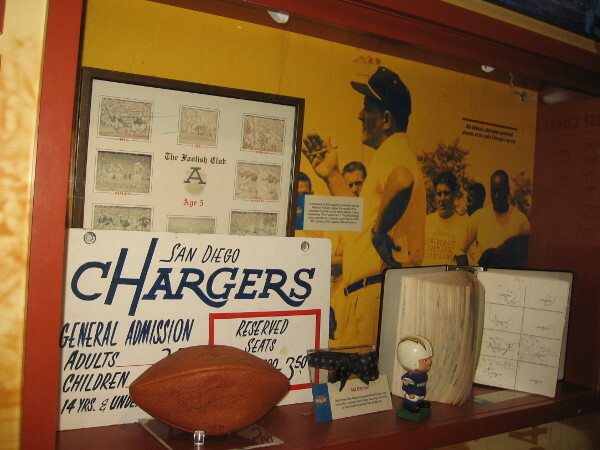 The San Diego Chargers produced many fond memories for local football fans. 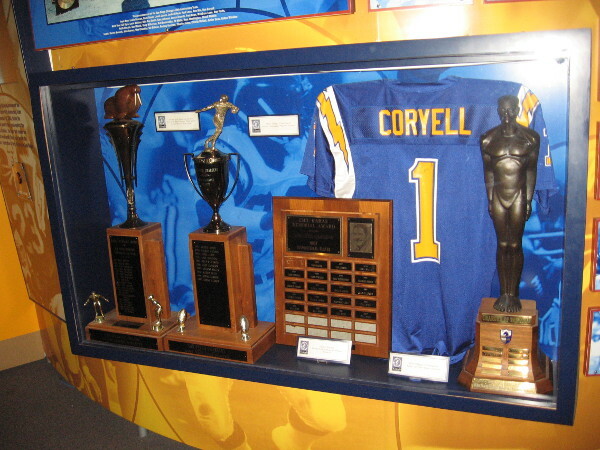 Trophies and plaques from the exciting Don Coryell era San Diego Chargers. More NFL football memories from the 90’s. 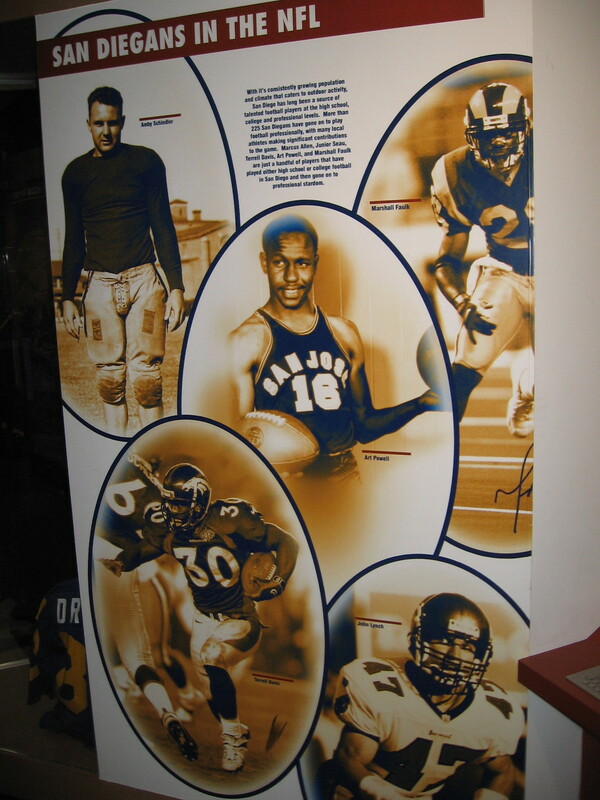 This display shows some San Diegans who starred in the NFL, including Marcus Allen, Junior Seau, Terrell Davis, Art Powell and Marshall Faulk. 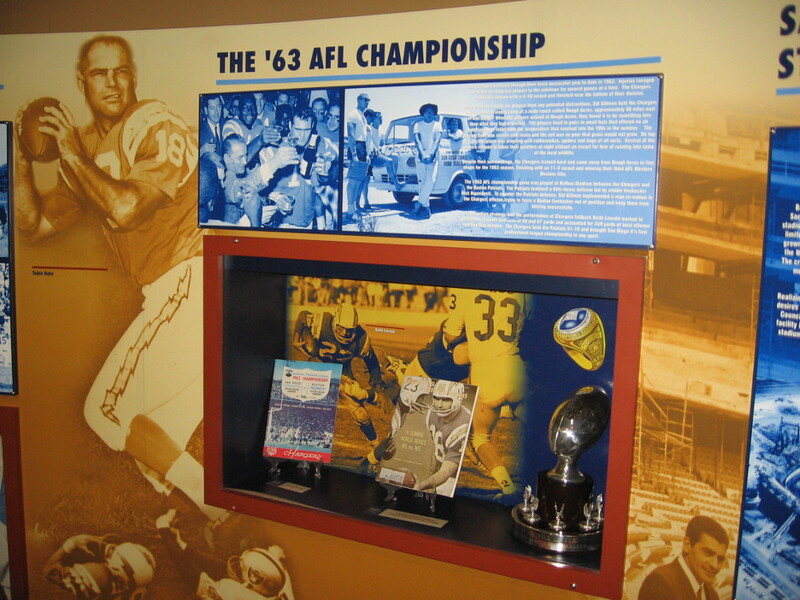 The San Diego Chargers won the AFL Championship in 1963. 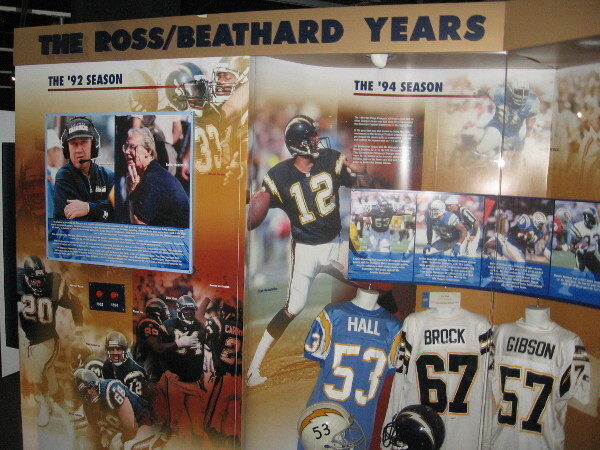 Exhibit fondly remembers the early days of the San Diego Chargers. 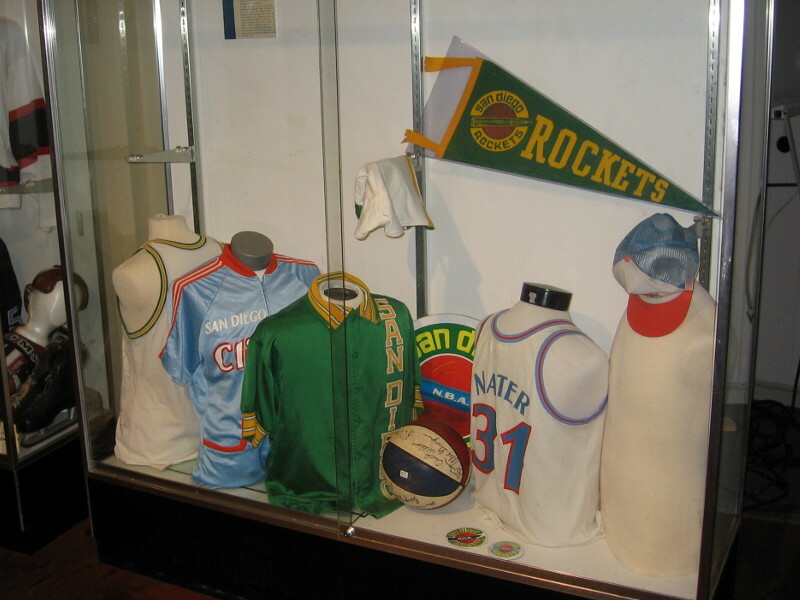 A display case at the Hall of Champions dedicated to San Diego basketball’s original NBA Clippers and Rockets. 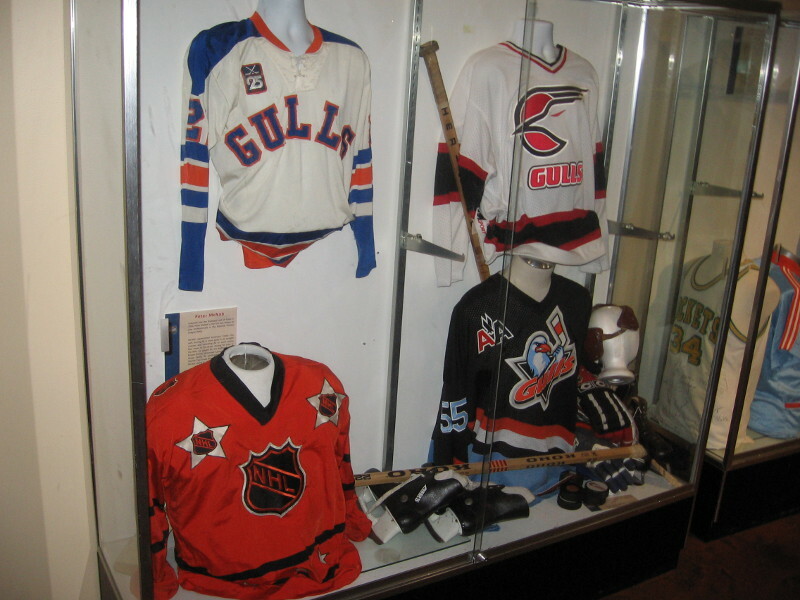 Jerseys and equipment from different incarnations of the San Diego Gulls hockey team. Surfing is a major sport in Southern California. 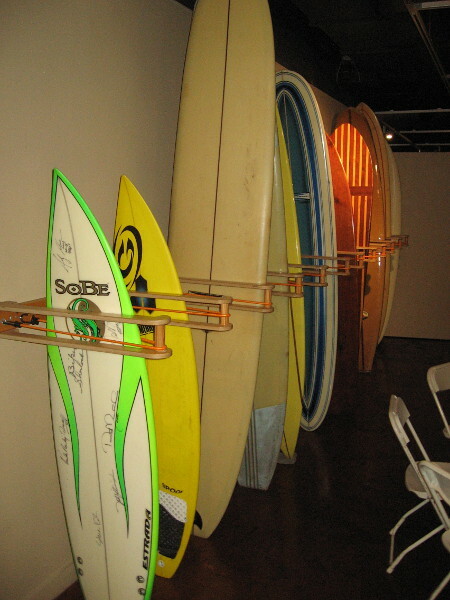 So many different surfboards are displayed in the San Diego Hall of Champions. 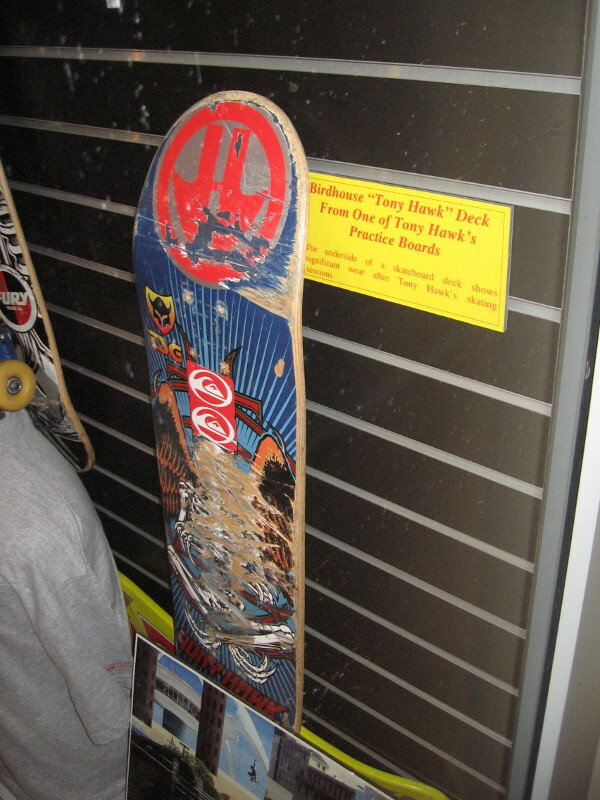 The underside of one of Tony Hawk’s practice skateboards shows a lot of wear! 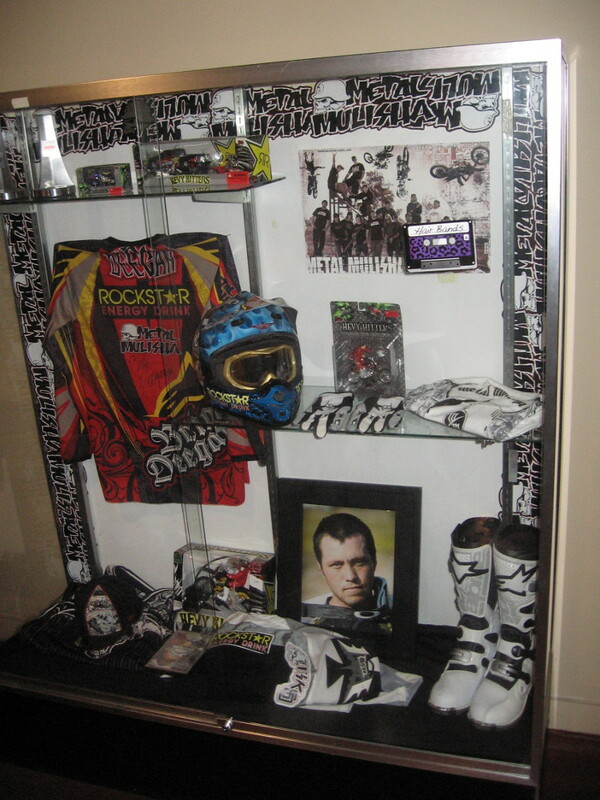 Motocross exhibit at the Hall of Champions. 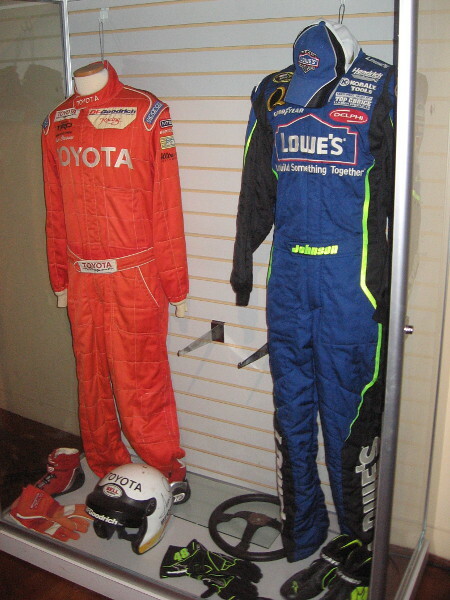 An exhibit features a NASCAR racing suit worn by 7-time champion Jimmie Johnson, who grew up in El Cajon. 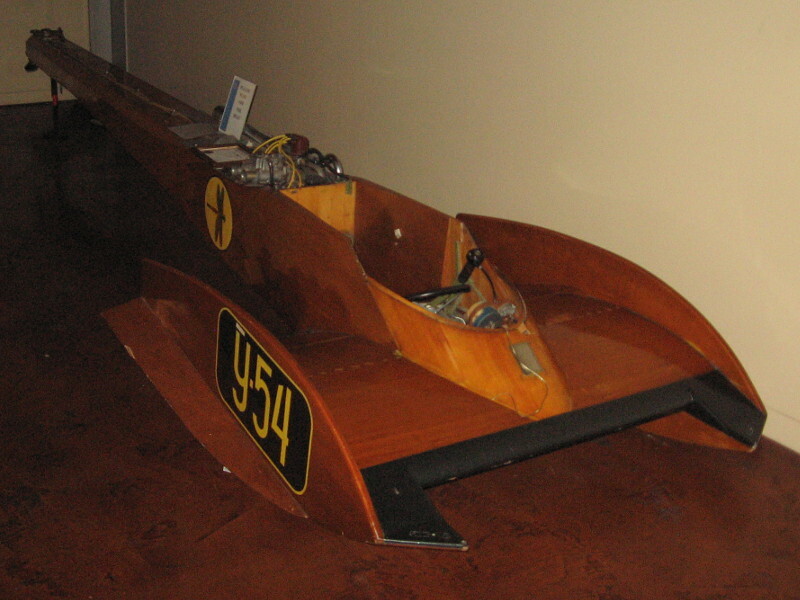 An inboard hydroplane that set a world record in 1975. Designed by San Diegan Steve Ball, this 850 C.C. 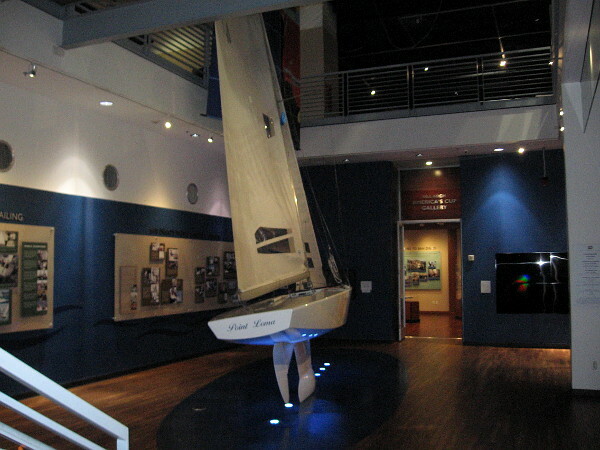 inboard Hydroplane is on display at the Hall of Champions. 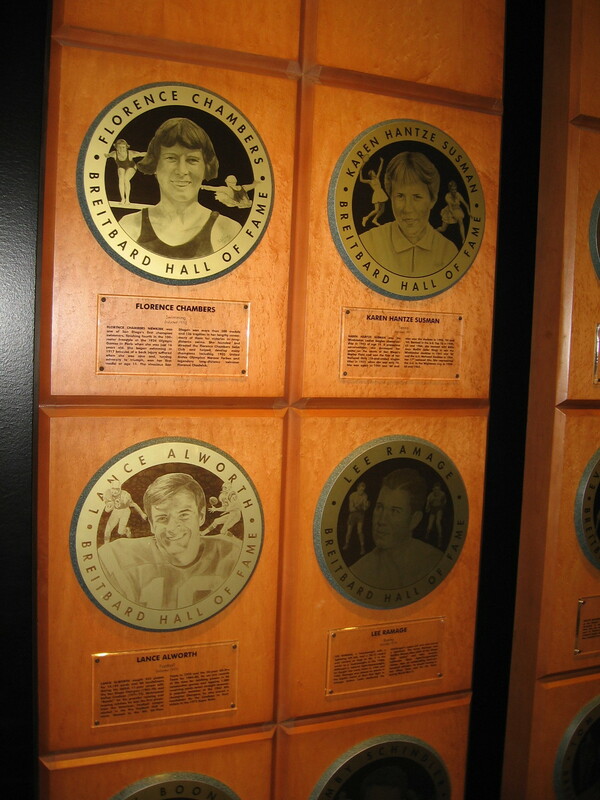 Two walls on the Hall of Champions’ second floor house the Breitbard Hall of Fame, celebrating great San Diego athletes. 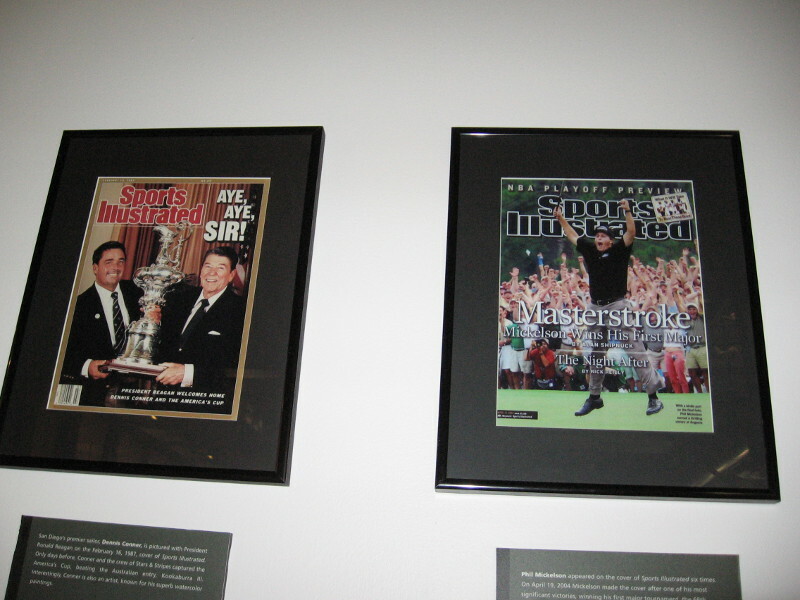 A random photograph of one section of the Breitbard Hall of Fame. 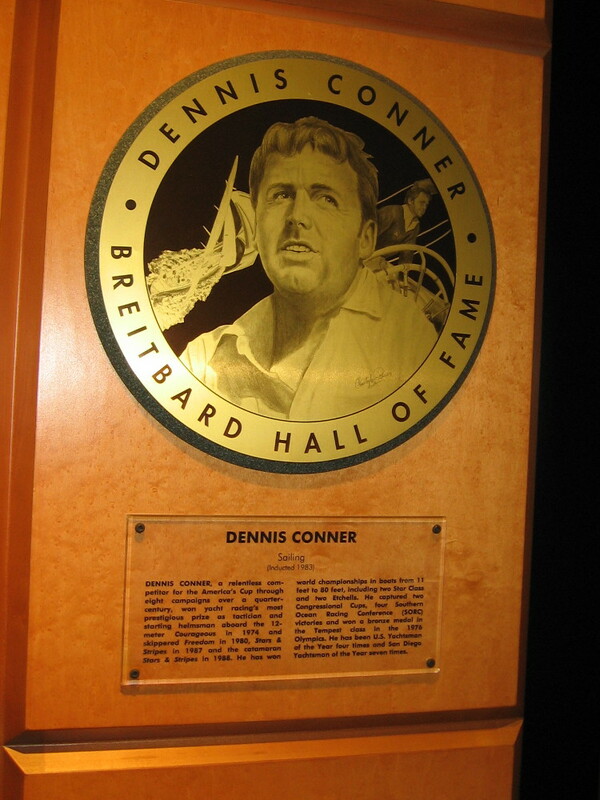 Dennis Conner has been called America’s greatest sailor. 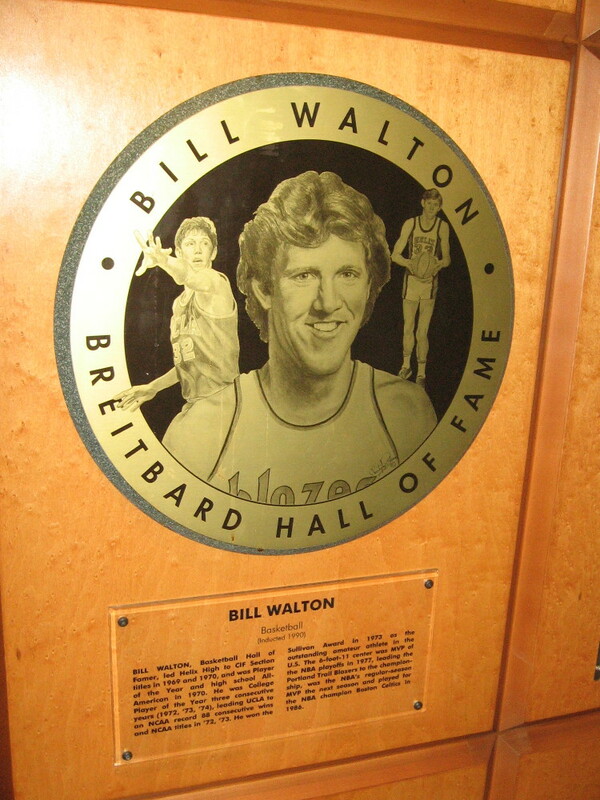 Bill Walton is considered one of the greatest basketball players of all time. Another wall on the second floor of the Hall of Champions contains Sports Illustrated covers that feature San Diego athletes. Dennis Conner with Ronald Reagan, and Phil Mickelson winning his first major. Heavyweight boxing champion Ken Norton prepares for his first defense. As of June 2008, the Sports Illustrated feature story has included San Diegans 113 times. 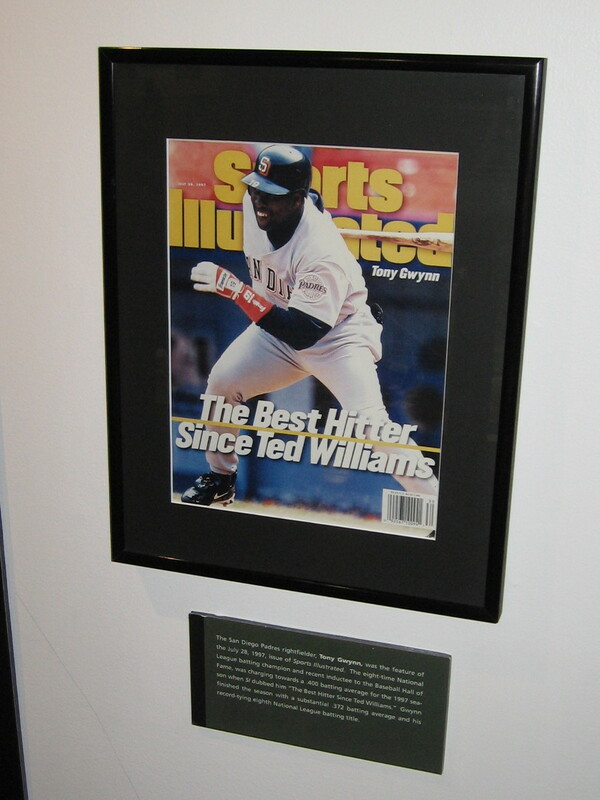 Tony Gwynn, the best hitter since Ted Williams. 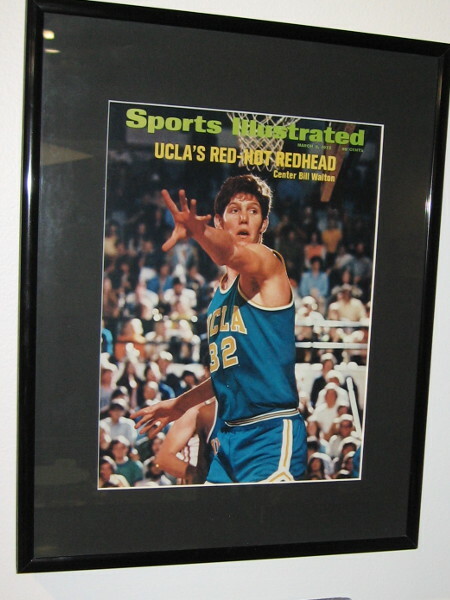 UCLA’s red-hot redhead, center Bill Walton. 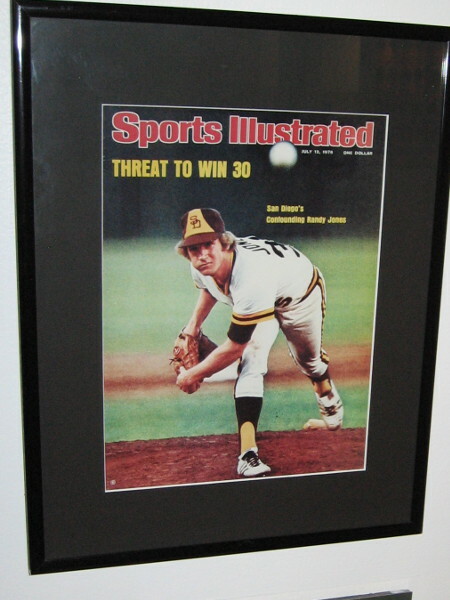 Randy Jones’ threat to win 30. 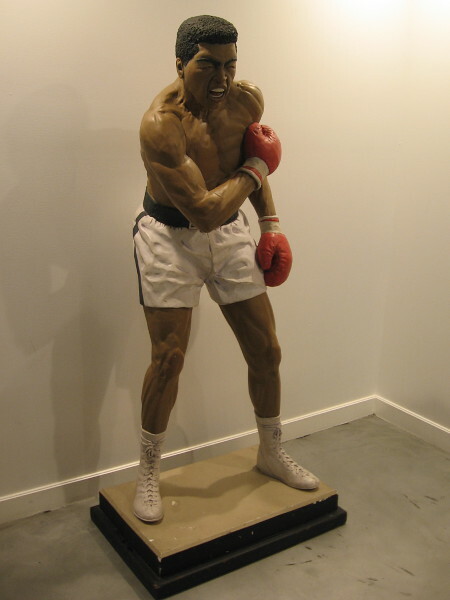 A sculpture of Muhammad Ali in a corner of the Hall of Champion’s second floor. Now we check out the second wall of the Breitbard Hall of Fame. 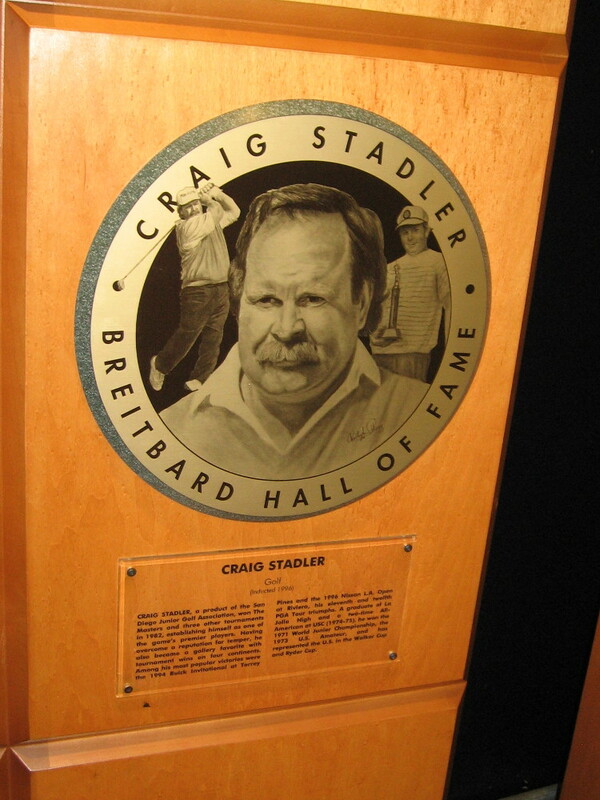 Golf’s Craig Stadler was a product of the San Diego Junior Golf Association. 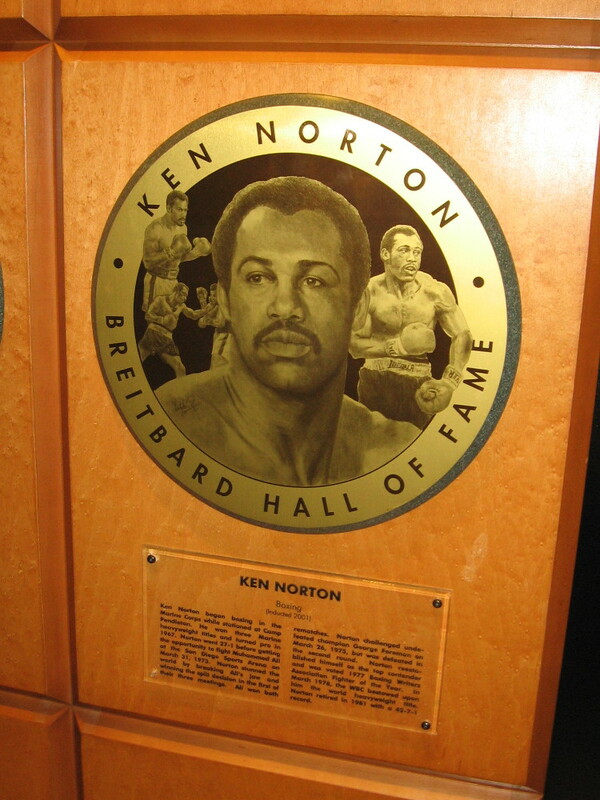 Ken Norton began boxing in the Marine Corps while stationed at Camp Pendleton. 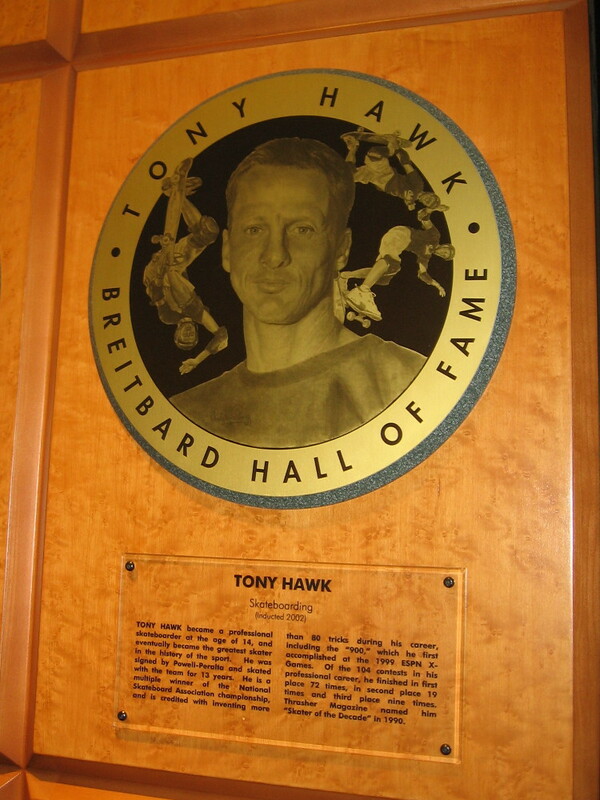 Skateboarding legend Tony Hawk makes San Diego proud. 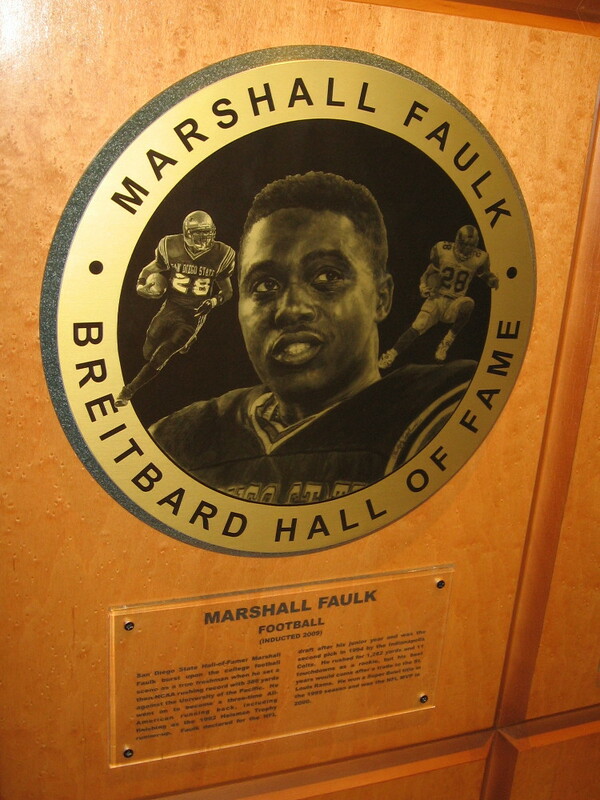 Marshall Faulk broke NCAA rushing records at San Diego State University. 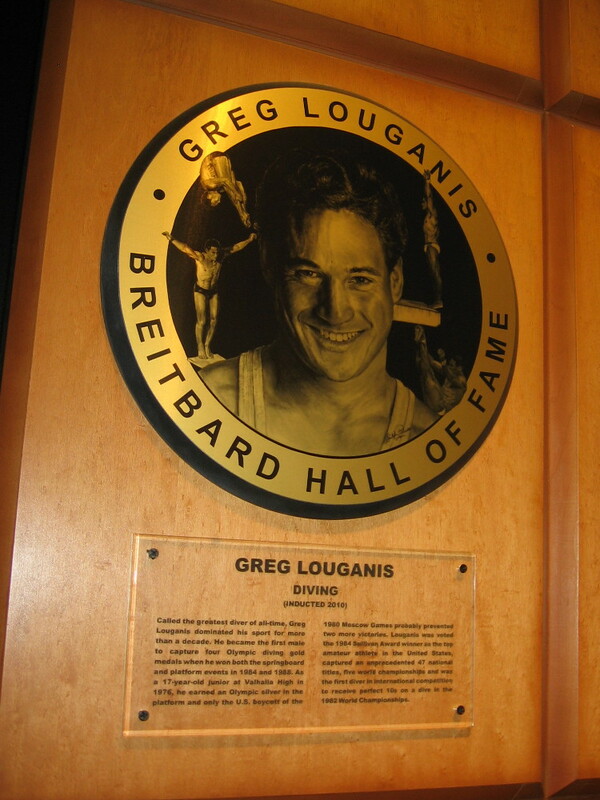 Greg Louganis of San Diego has been called the greatest diver of all time. 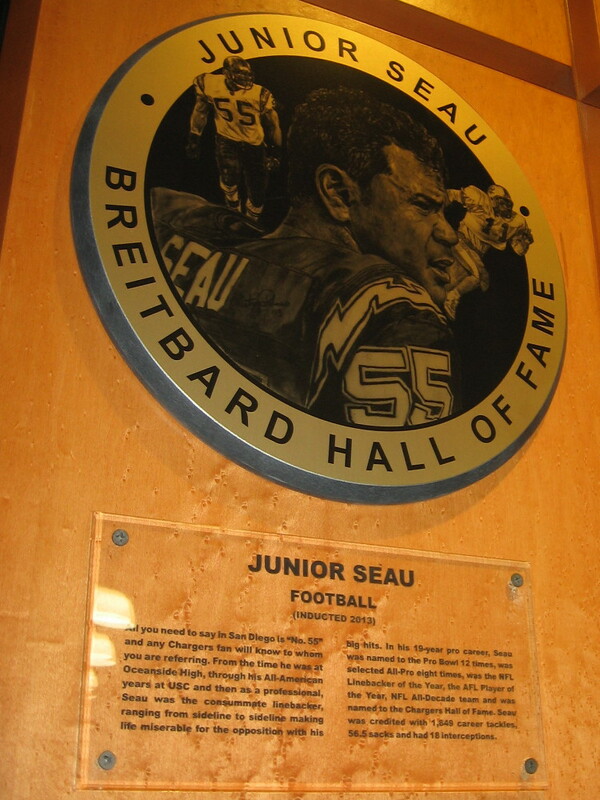 Junior Seau is remembered with love by many in San Diego. He was an NFL football great. 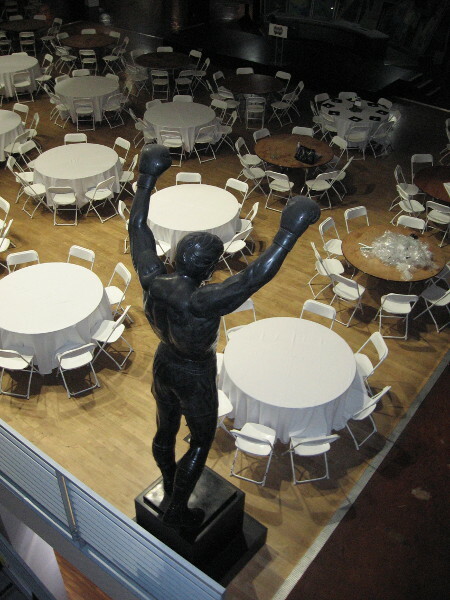 The statue of Muhammad Ali looks down at tables set for a special evening event at the San Diego Hall of Champions. Gazing down at the front entrance of the sports museum from the second floor. 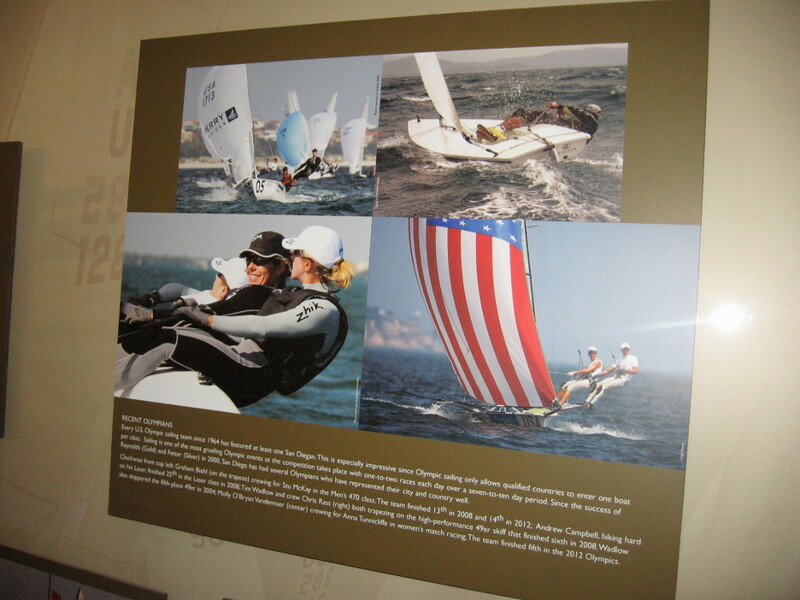 The lower level of the Hall of Champions is dedicated to competitive sailing. It isn’t surprising that San Diego has produced many of the greatest sailors in the world. 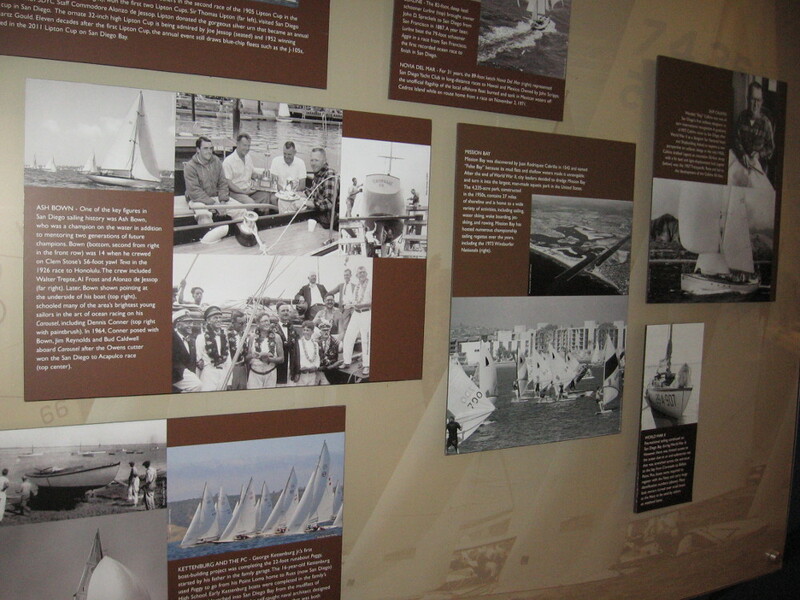 One of many displays that recalls sailing’s very rich history in San Diego. 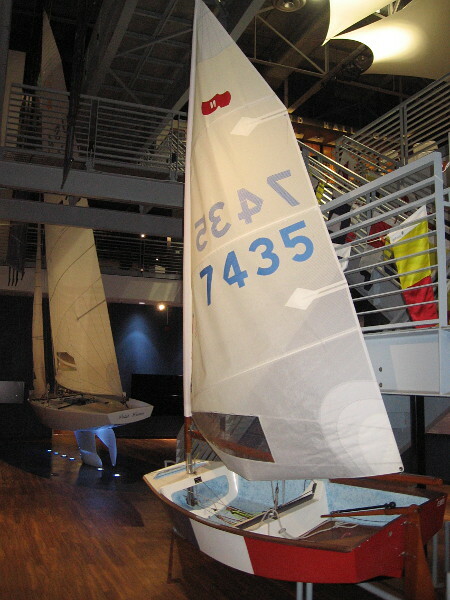 Two small sailboats inside the San Diego Hall of Champions. 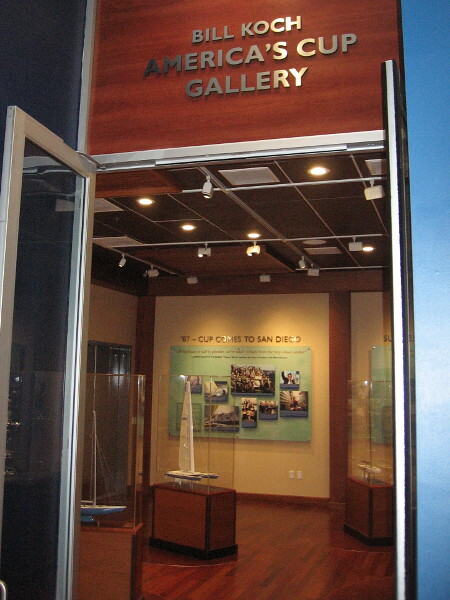 San Diego has produced many sailing World Champions. 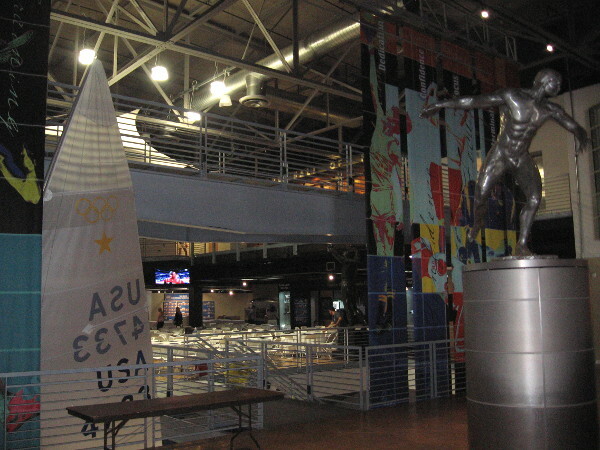 Every U.S. Olympic sailing team since 1964 has featured at least one San Diegan. 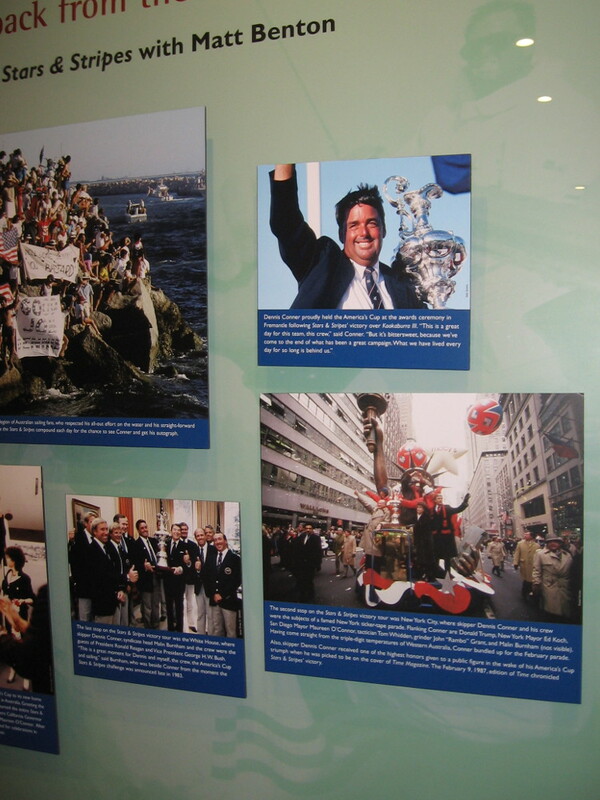 A look into the Hall of Champion’s Bill Koch America’s Cup Gallery. 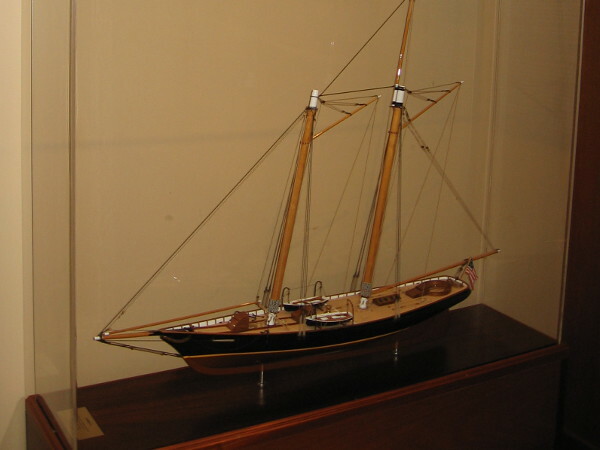 A model of America, the racing schooner that beat many British competitors in 1851, establishing the America’s Cup. Today, a replica full-size boat makes San Diego Bay its home. 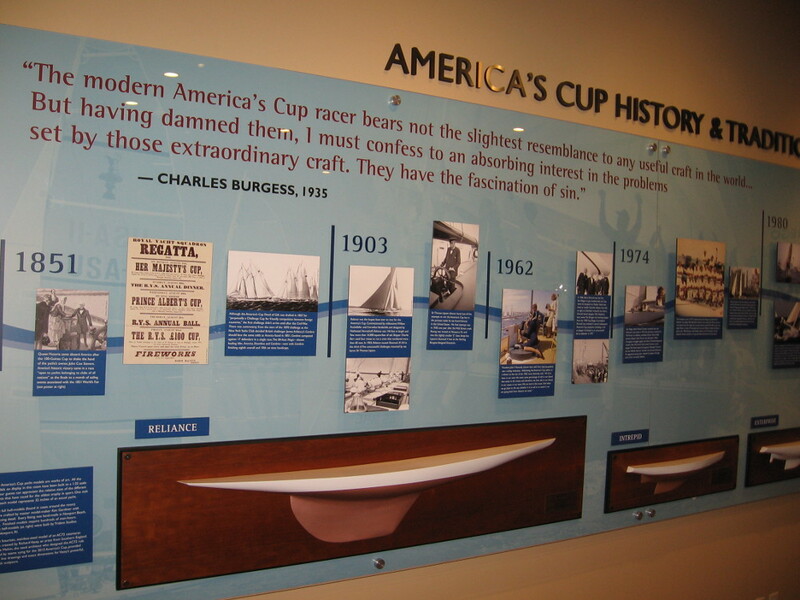 A timeline shows America’s Cup history and traditions, including the evolution of racing craft. 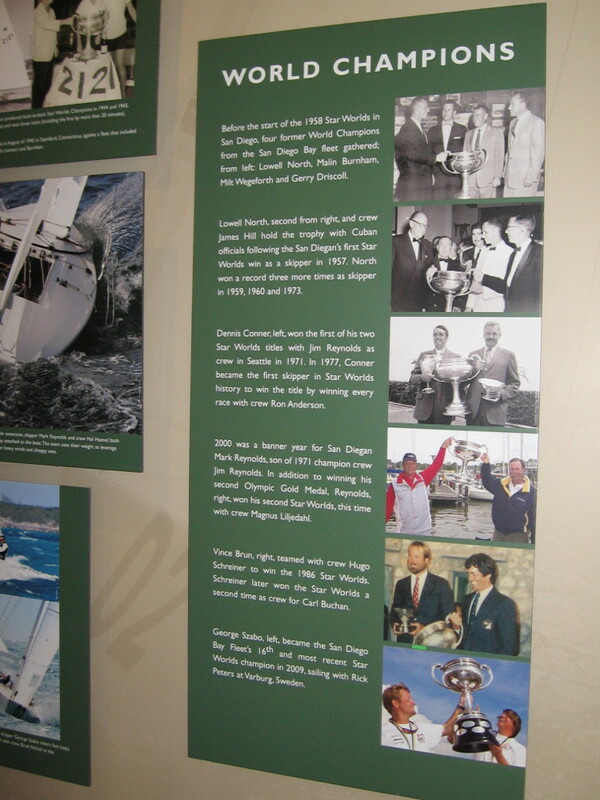 San Diego Yacht Club’s Dennis Conner won the America’s Cup four times. 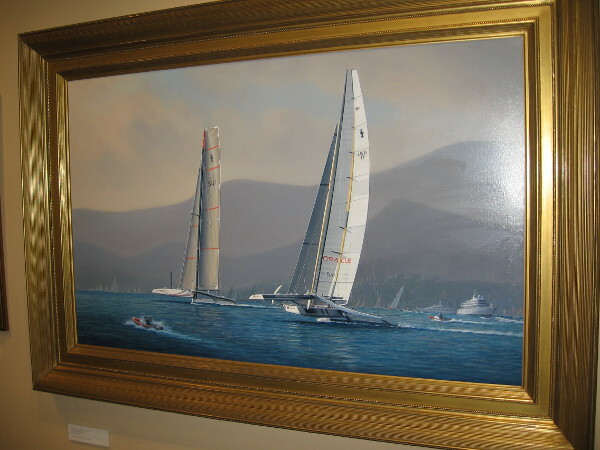 Painting of Oracle vs. Alinghi, 2010. By artist Tim Thompson. 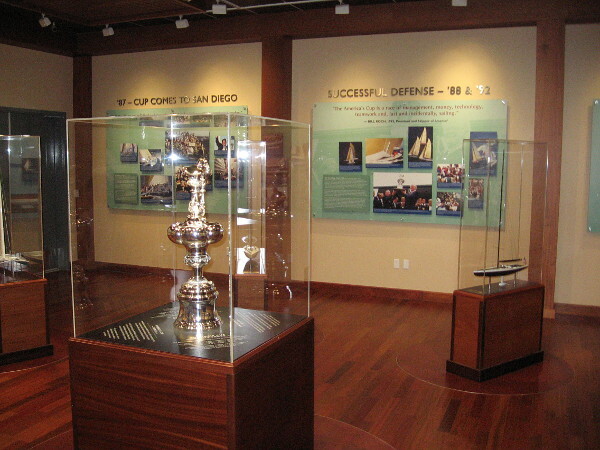 A replica of the America’s Cup, the oldest international sporting trophy in the world. 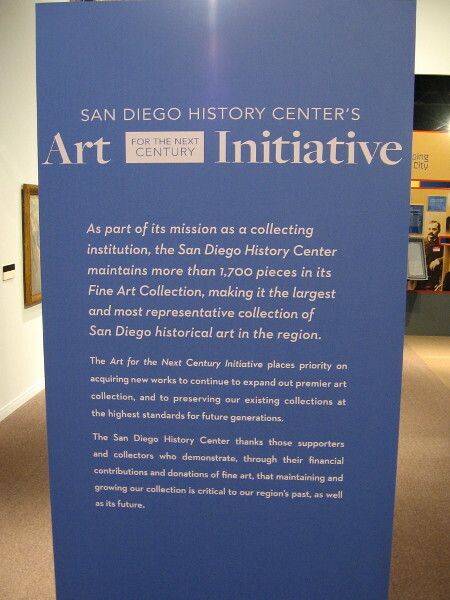 Posted on March 19, 2017 March 19, 2017 Tags balboa park, baseball, comic-con, famous, federal building, football, golf, hall of champions, history, museums, news, sailing, san diego, sports3 Comments on A final look inside the San Diego Hall of Champions. 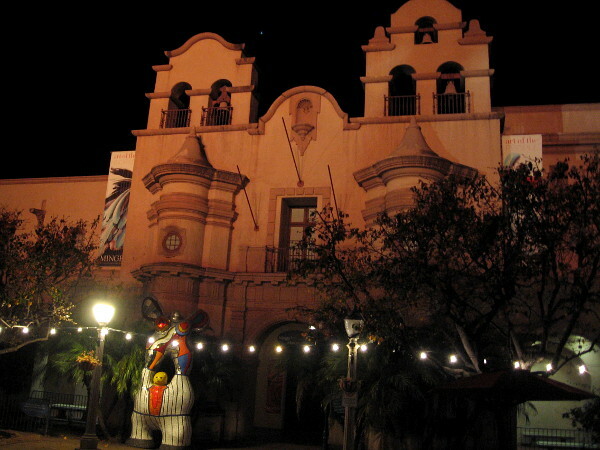 Magic in Balboa Park as night falls. 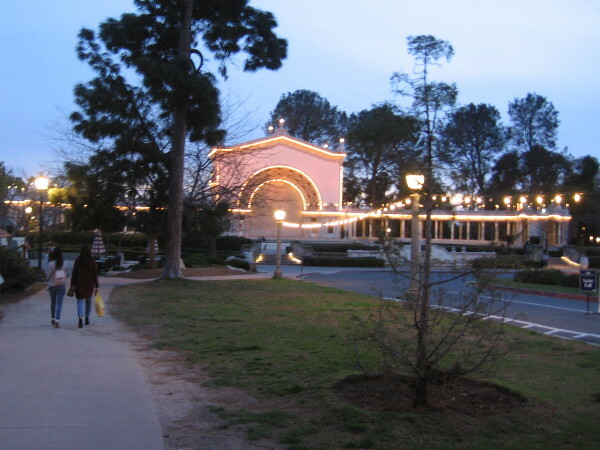 Walking down toward the Spreckels Organ Pavilion as night approaches in Balboa Park. I got off work a bit early today, so I took an evening walk through Balboa Park. Few people were still about as darkness began to descend. Just an ordinary Thursday in early February–a quiet time of year. I managed to capture a few photos of Balboa Park’s wonderful magic as night fell. North side of the House of Charm and Alcazar Garden. The lights have come on along El Prado. 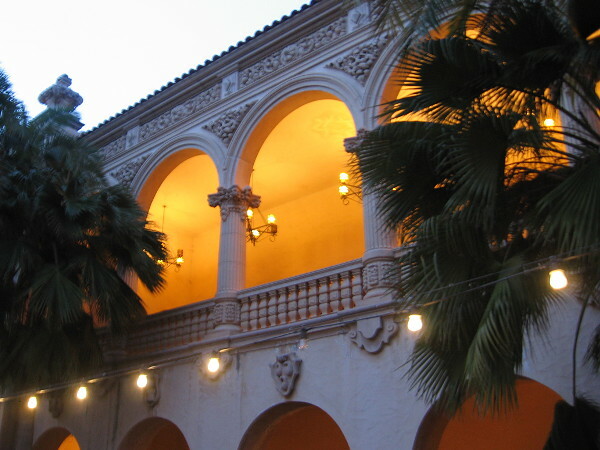 Beautiful light shines from the facade of Casa del Prado. 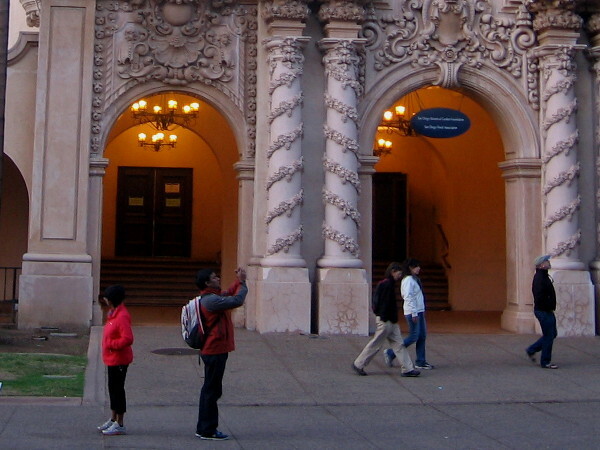 Balboa Park visitors walk along El Prado as darkness nears. Golden light behind the second story arches of the Casa del Prado. Few people remain in the Japanese Friendship Garden as darkness falls. All is quiet and very beautiful. 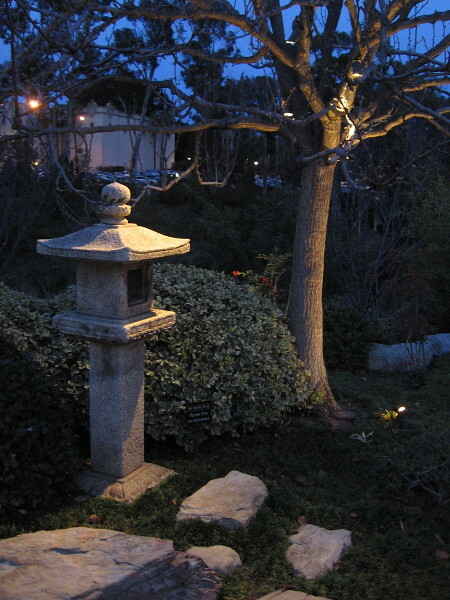 Night produces rare magic near the Exhibit Hall at Balboa Park’s Japanese Friendship Garden. 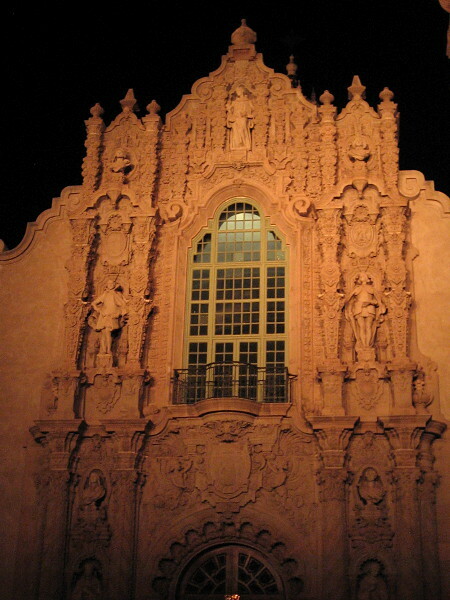 The ornate facade of the Museum of Man becomes rich with depth and color when lit at night. 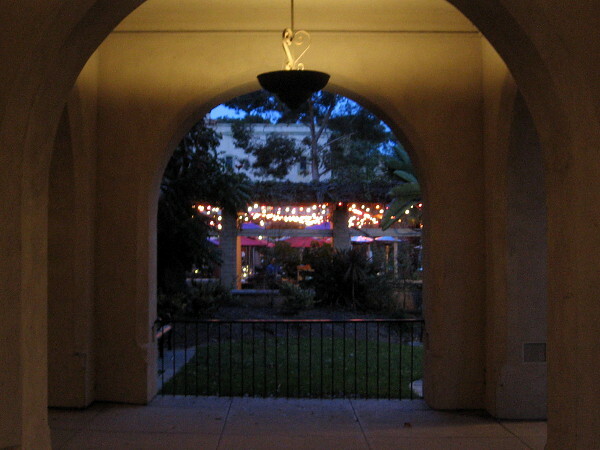 Photo through arches of lights illuminating the outdoor patio of The Prado at Balboa Park, a fine restaurant located in the House of Hospitality. 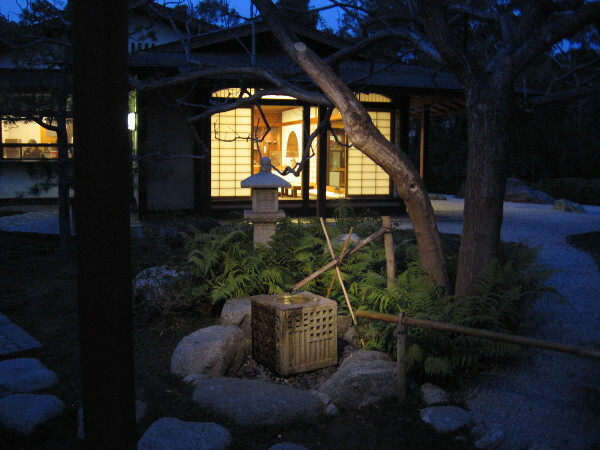 The House of Charm, home to the Mingei International Museum, like a glowing dream in the darkness. 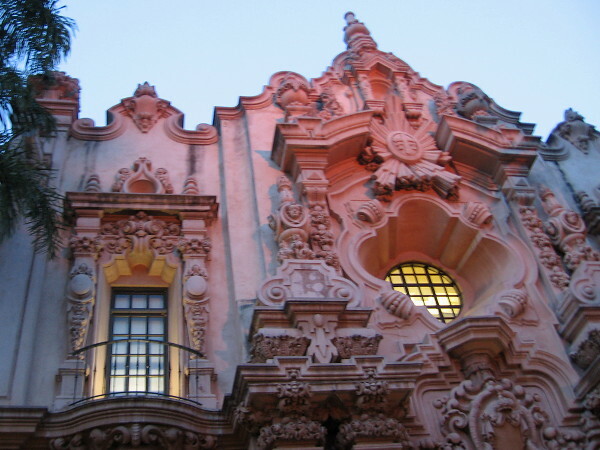 Posted on February 2, 2017 December 11, 2017 Tags architecture, balboa park, beautiful, buildings, casa del prado, el prado, house of charm, japanese friendship garden, light, magic, museums, night, photography, walkingLeave a comment on Magic in Balboa Park as night falls. Floral Association event honors Kate Sessions. Photograph of the handsome Marston House across the south lawn. 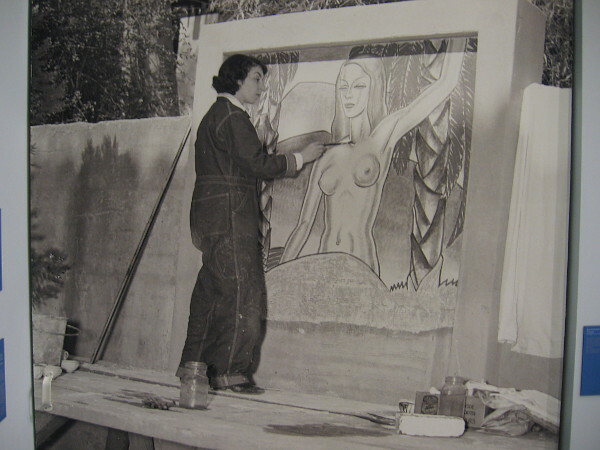 Kate Sessions, the pioneering horticulturist who is often called the Mother of Balboa Park, was honored yesterday at an event held at the beautiful George Marston House and Gardens. 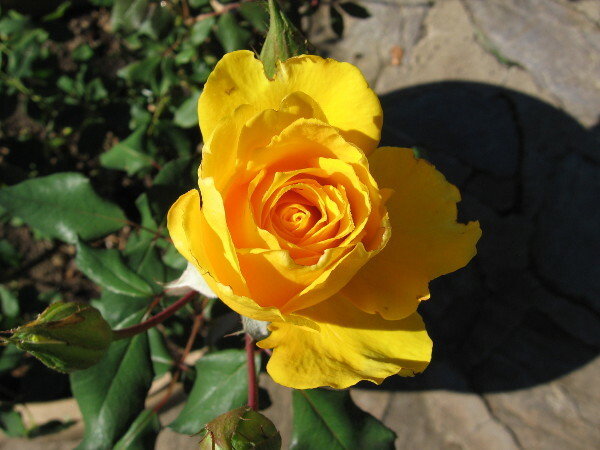 Every year the San Diego Floral Association throws a special birthday party for Kate Sessions, who was born on November 8, 1857. 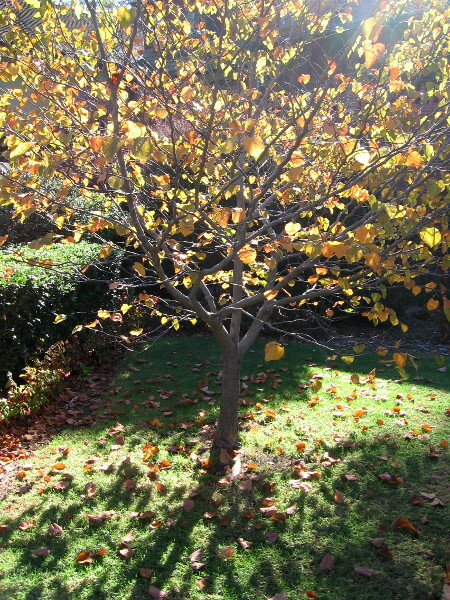 Many of the large trees that grow today around Balboa Park were planted in person by Kate Sessions over a century ago. 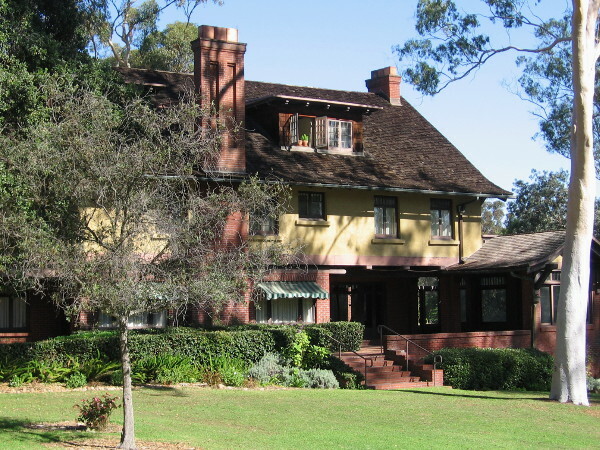 That the annual floral party is held in the sprawling gardens of the 1905 Marston House is appropriate, because George W. Marston, successful businessman and founder of the San Diego Historical Society, was also an important advocate for Balboa Park. 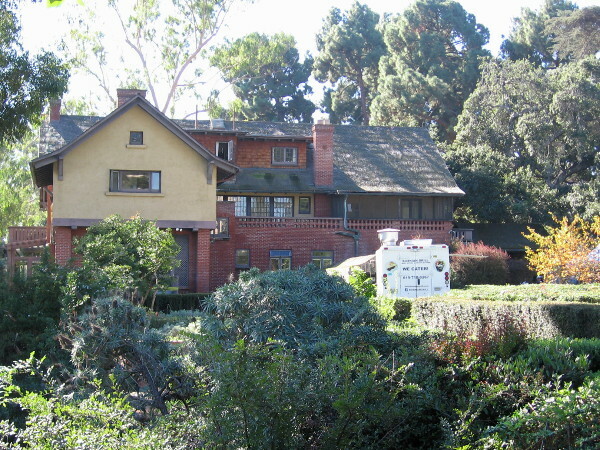 His old house, situated in the northwest corner of the park, is a fine example of the Arts and Crafts architectural movement. It was designed by famous architects William Sterling Hebbard and Irving Gill. 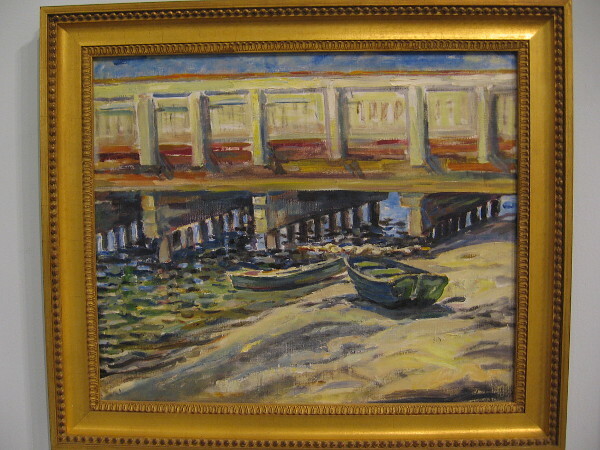 Today it is the home of a historical museum. 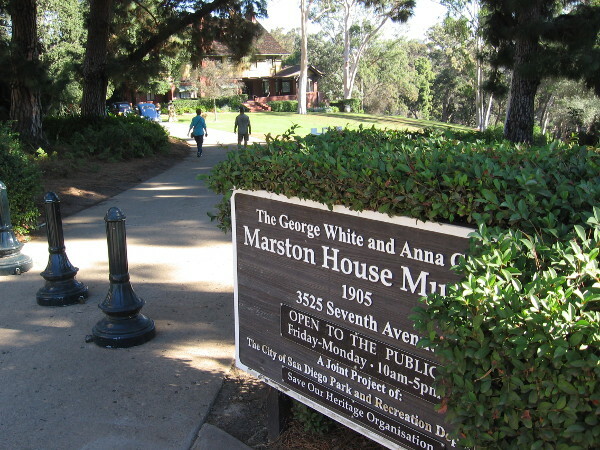 The Marston House Museum and its lovely gardens are open to the public in the northwest corner of Balboa Park. 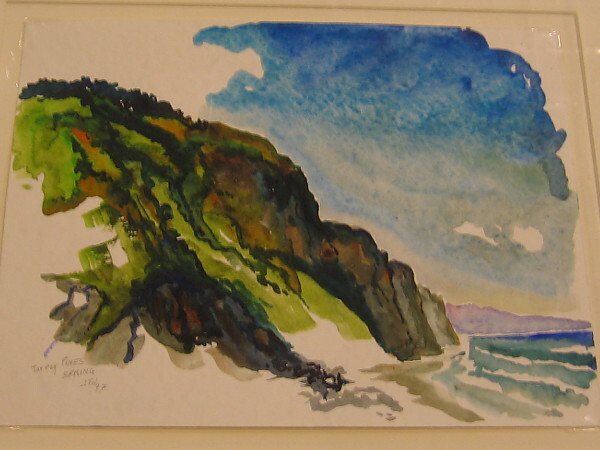 The current exhibit is titled Irving Gill – Progress and Poetry in Architecture. 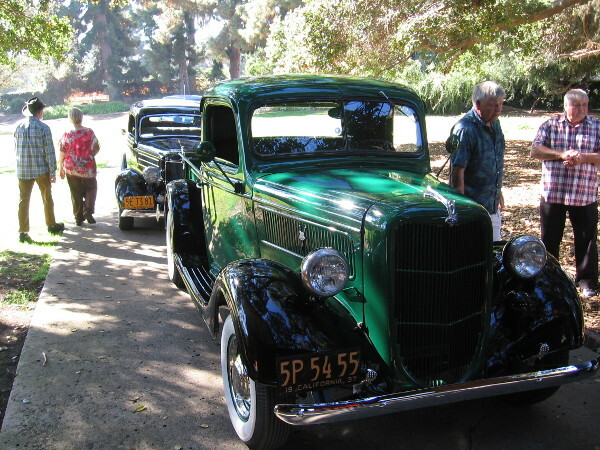 Several vintage automobiles from the Early Ford V8 Club were on display in front of the house. 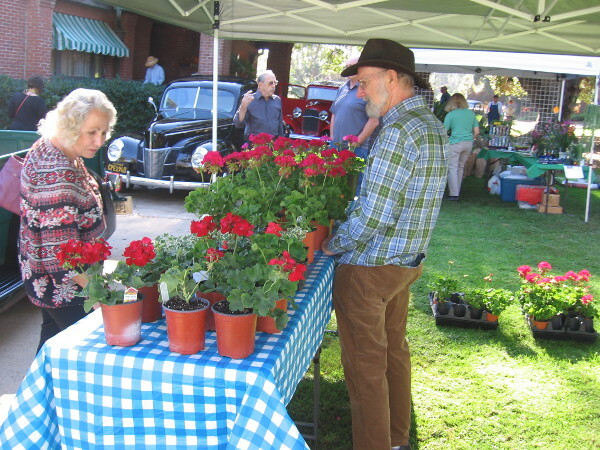 Geraniums and other colorful plants were for sale on the Marston House grounds. 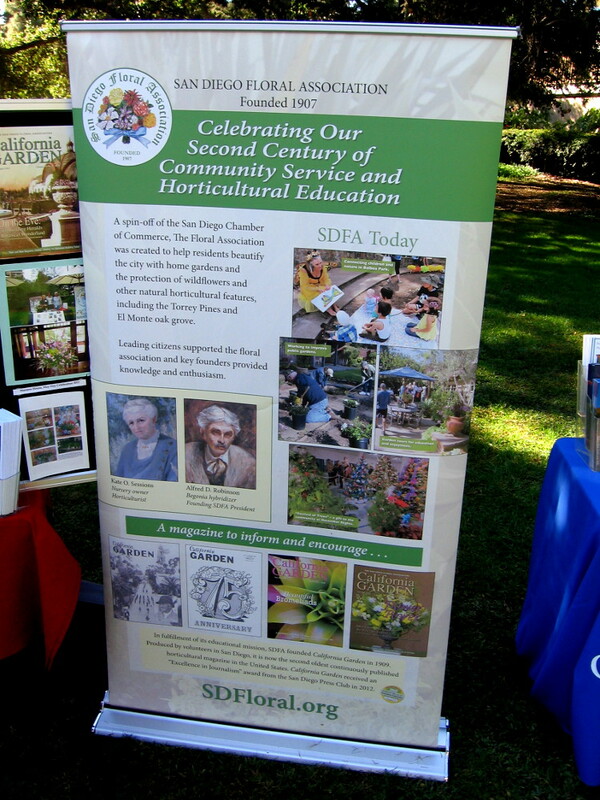 The San Diego Floral Association, founded in 1907, is celebrating their second century of community service and horticultural education. Victorian attire and a food truck greet visitors to the fun annual event. 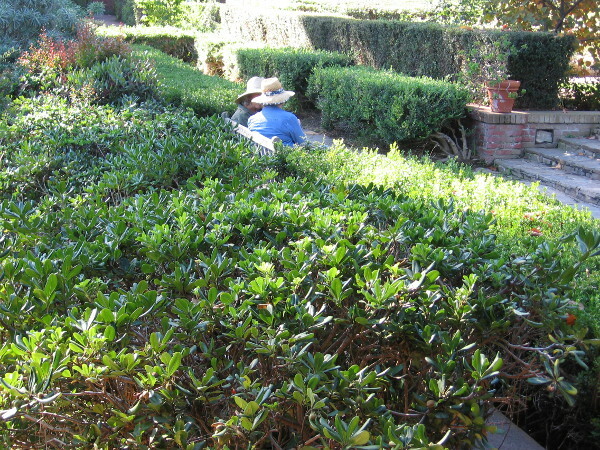 View of the Marston House from the north, across a section of the gardens. Beds of blooming roses in the Marston House gardens. Sitting quietly on a bench among green hedges. 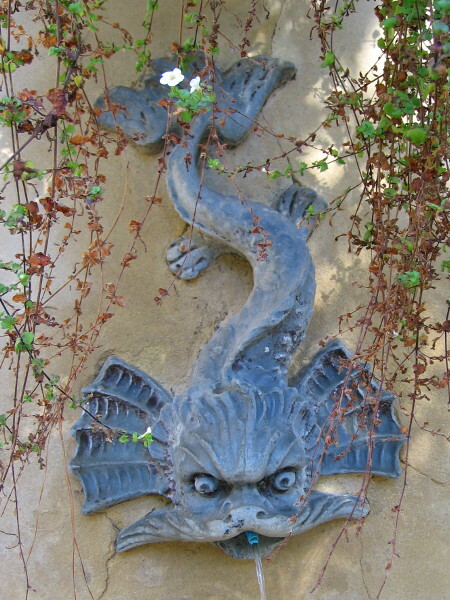 Fountain in the gardens of Balboa Park’s historical Marston House. 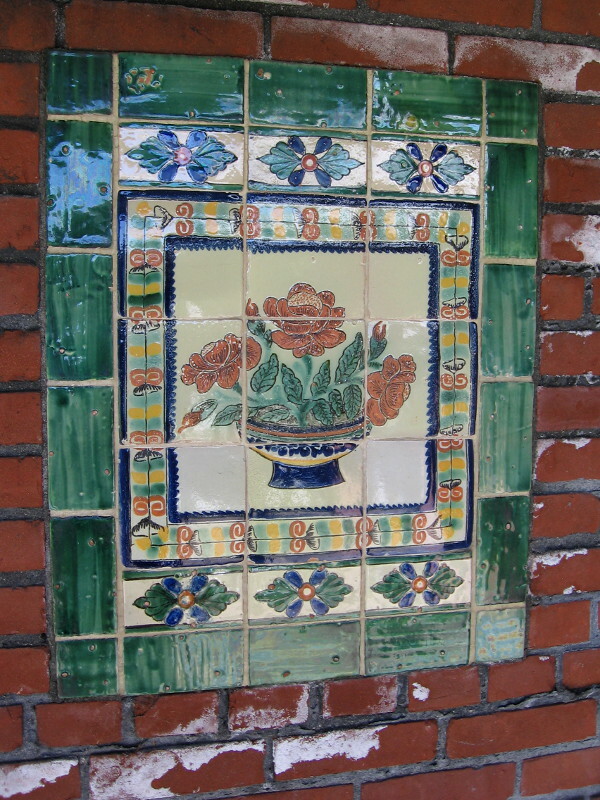 Beautiful tiles with images of flowers. 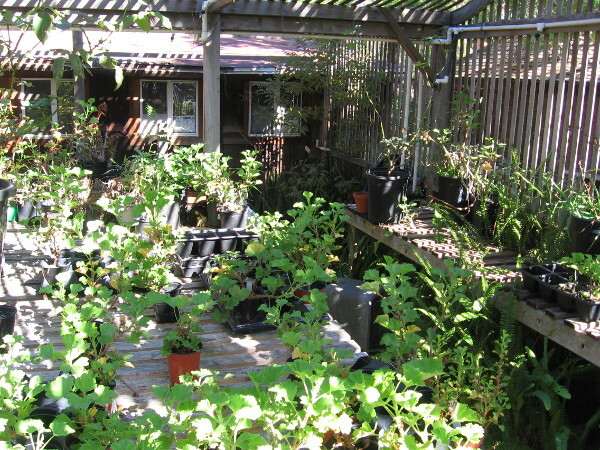 A peek inside the lath greenhouse between the Marston House and its carriage house, which now operates as a museum store. Posted on November 6, 2016 Tags architecture, balboa park, beautiful, events, flowers, gardens, history, marston house, museums, photography, plants, roses, san diego, treesLeave a comment on Floral Association event honors Kate Sessions.